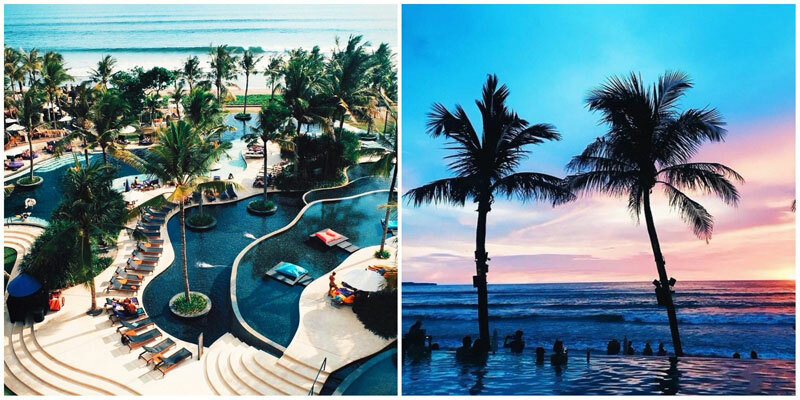 Have you always dreamed of spending your honeymoon in Bali, but are tight on budget? 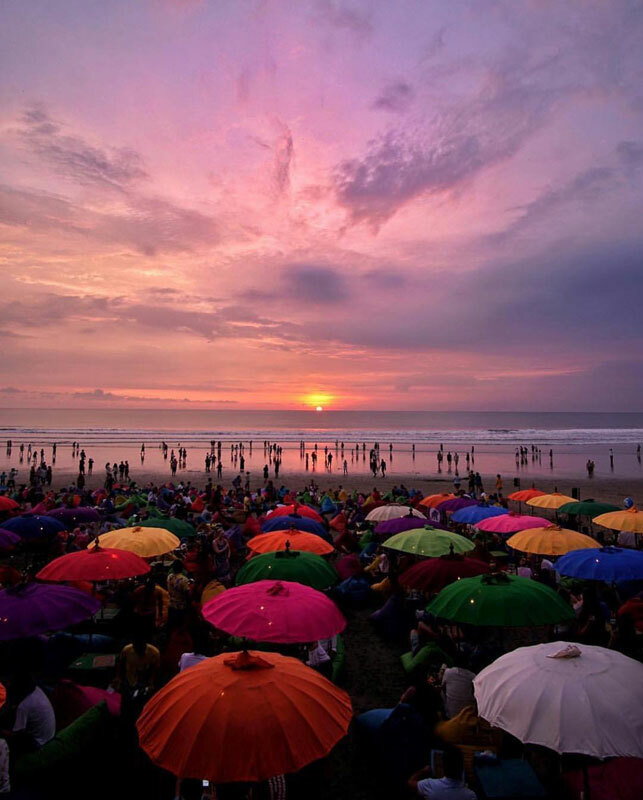 As a honeymoon destination, Bali is right up there with other romantic places like Paris or Hawaii. 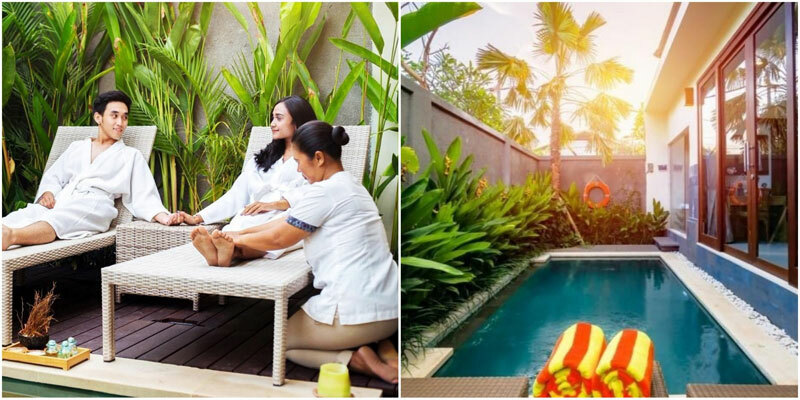 That’s not simply due to its breathtakingly beautiful nature or warm and welcoming culture, but also because Bali offers a wide range of options for couples when it comes to things to do, as well as impressive hotels & villas. 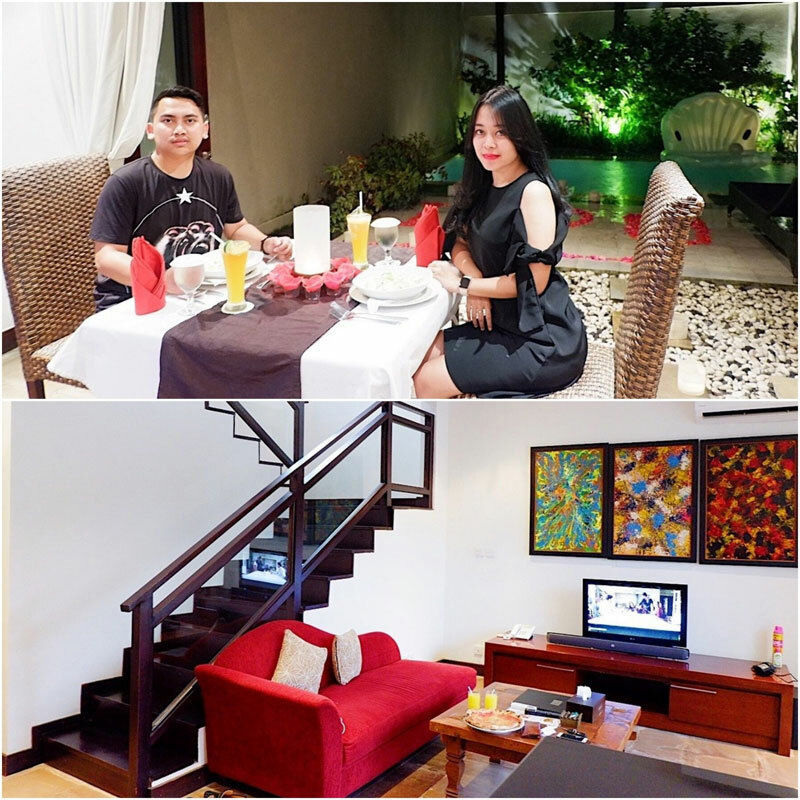 So though you may not want to burn a hole in your pocket, you still deserve memorable quality time with your significant other, in comfort and privacy. 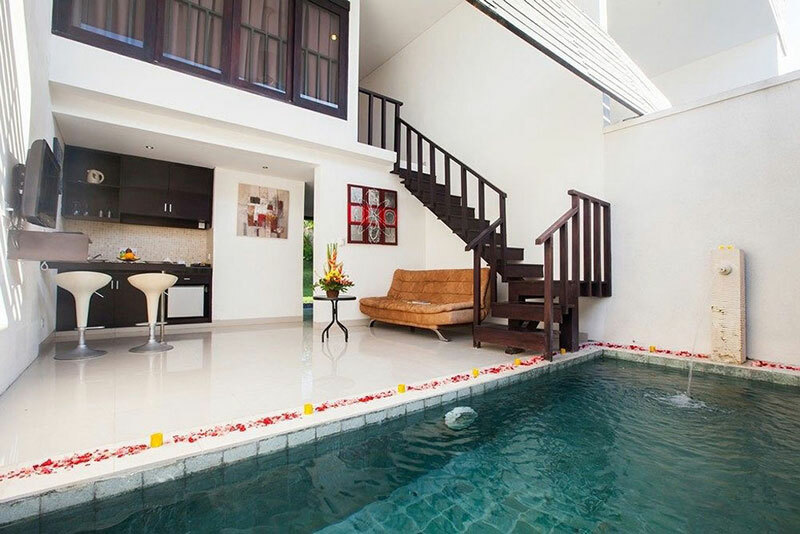 And what’s better than having a villa with your own private pool, all to yourself and your partner? 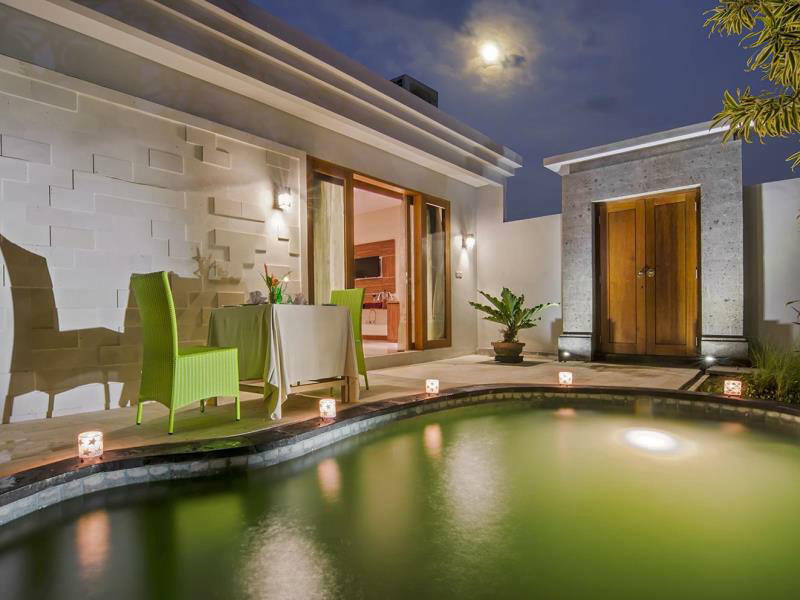 We bring you a list of such amazing private villas you can book for only under USD 100 a night! If you are an art lover, this villa is the place for you. 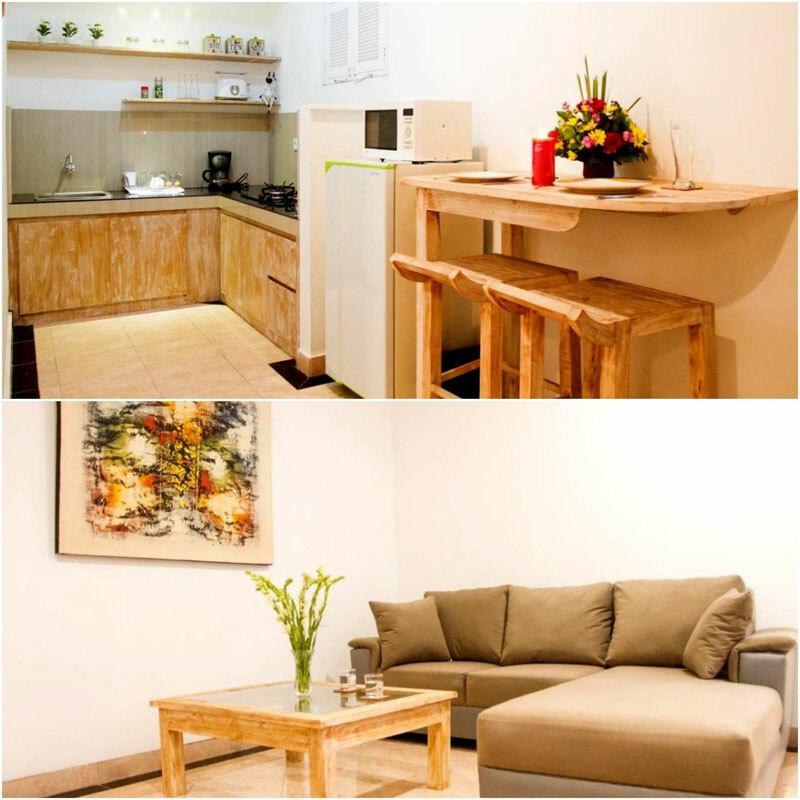 Its zen and modern furnishings are decorated with hints of contemporary art. 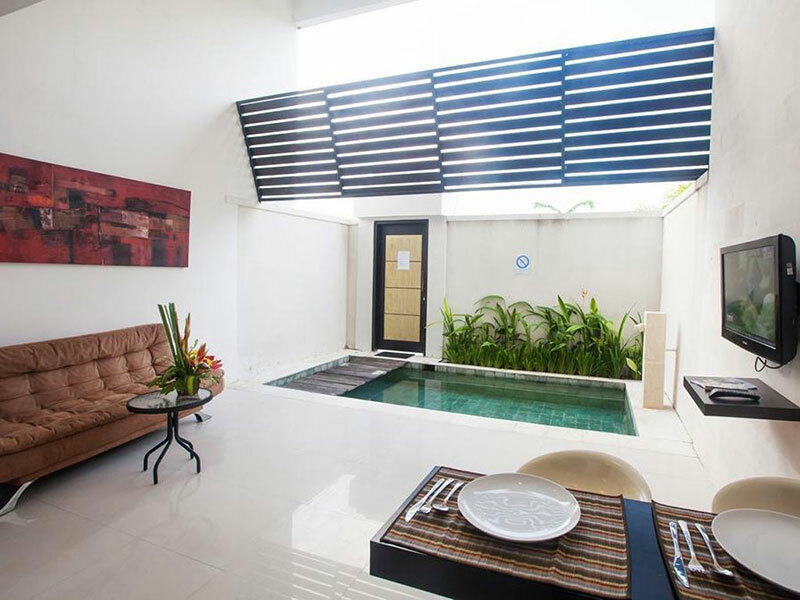 Located in the lively Seminyak, you’re basically in the heart of all the latest happenings. Don’t miss nearby local attractions such as the Kasih Ibu Hospital, Randelli Gallery and Kendra Gallery of Contemporary Art. 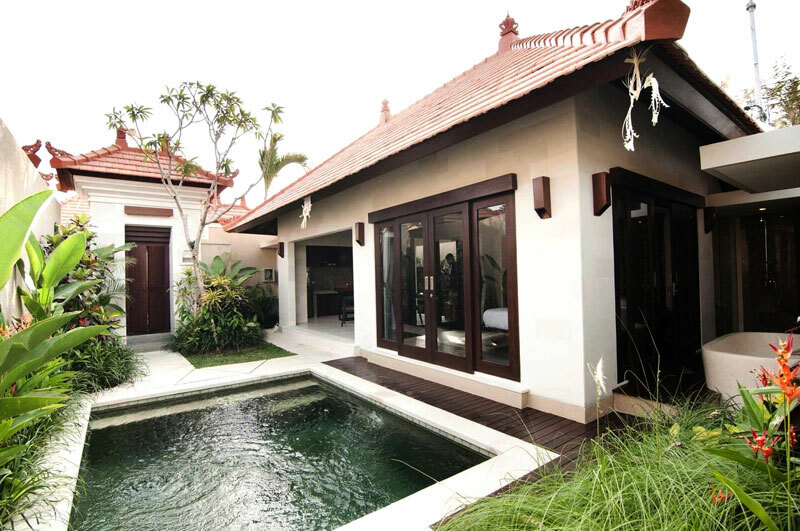 Embracing a Mediterranean concept, this villa is built on a hill in the Jimbaran area, facing directly towards Tanjung Benoa. Or enjoy breakfast bright and early? Perfect! And the best part is, you can also enjoy incredible ocean views while soaking in the private pool or relaxing in the small gazebo by the pool. Tired of relaxing? Cook up a storm in your very own kitchen, which is equipped with all the modern equipment you could possibly need. Or, if you’d rather not set fire to your villa, yummy seafood dishes are available at Jimbaran Beach, which is just a 10-minute drive away. For shopaholics, you’ll be happy to know that Bali Collection Shopping Centre is only 20 minutes away! With a little something for everyone, how could anyone be dissatisfied in this place? 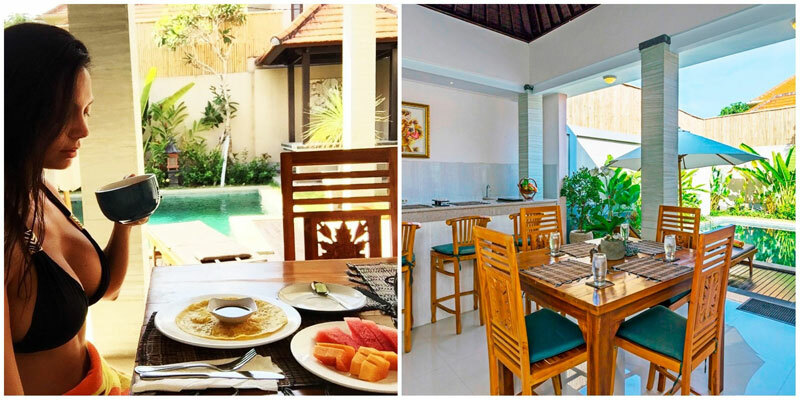 Nestled in the laidback Canggu, Pandan Tree Villa is a place where you can still enjoy the beach and spectacular Bali sunset without having to endure the persistent peddlers of touristy Kuta. The villa itself offers an open concept living space where you have your own private garden and a private pool as the centre piece. 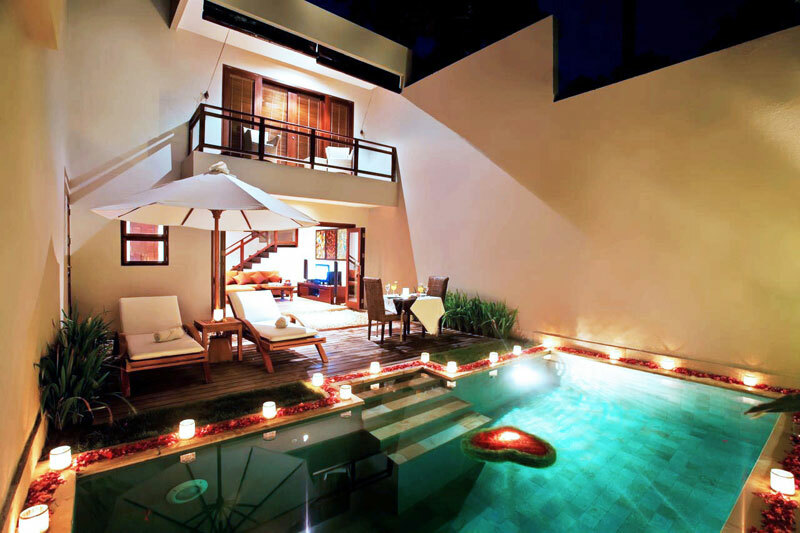 It’s customary for the staff to decorate the villa with candlelights for honeymooners. Doesn’t it sound simply romantic? 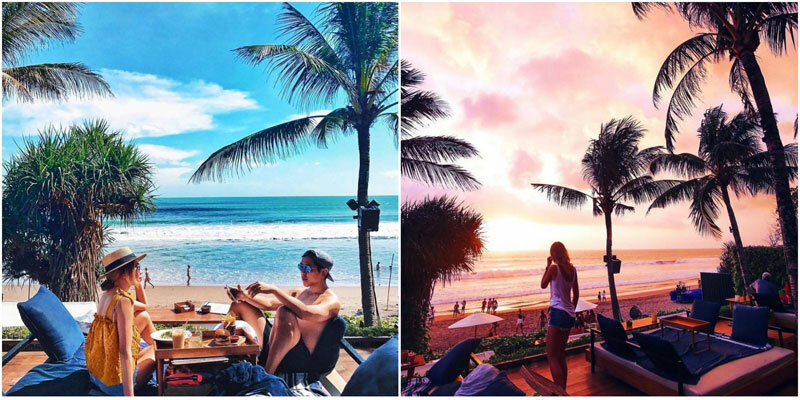 If you’re worried about food, you can actually easily find great restaurants and cafes in Canggu. 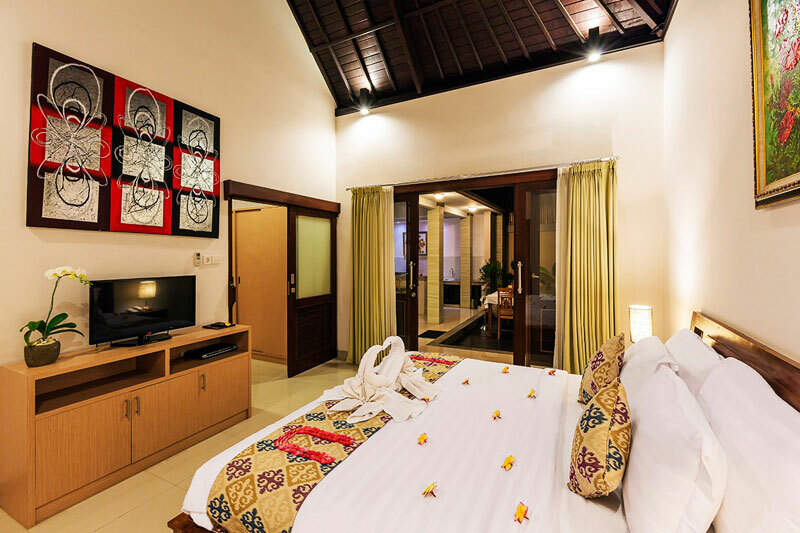 But if you don’t feel like venturing out of your private cocoon, the villa features a dining room and the staff are more than happy to arrange for your meals to be served there. 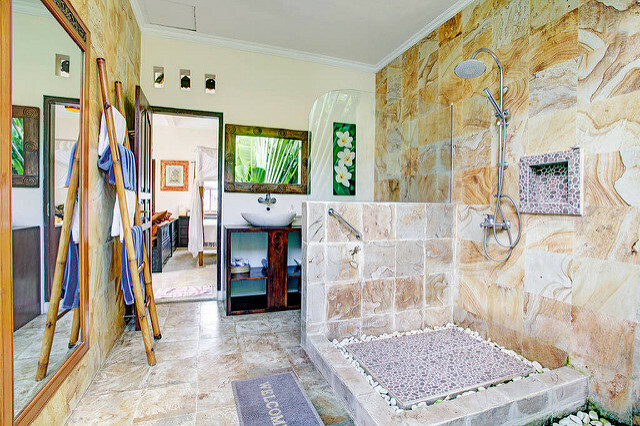 Though there’s no bathtub, the rainfall shower is spacious enough for two. 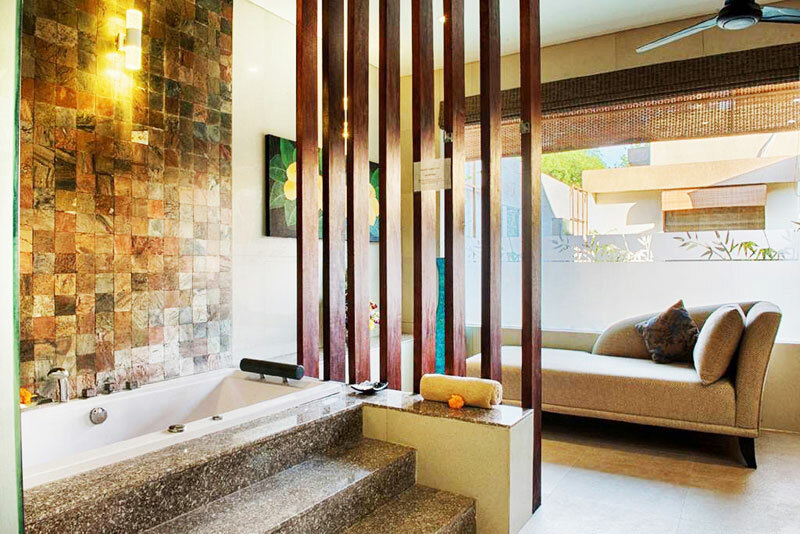 For those who crave space, luxury and self-indulgence, you won’t go wrong with Villa Lisha. 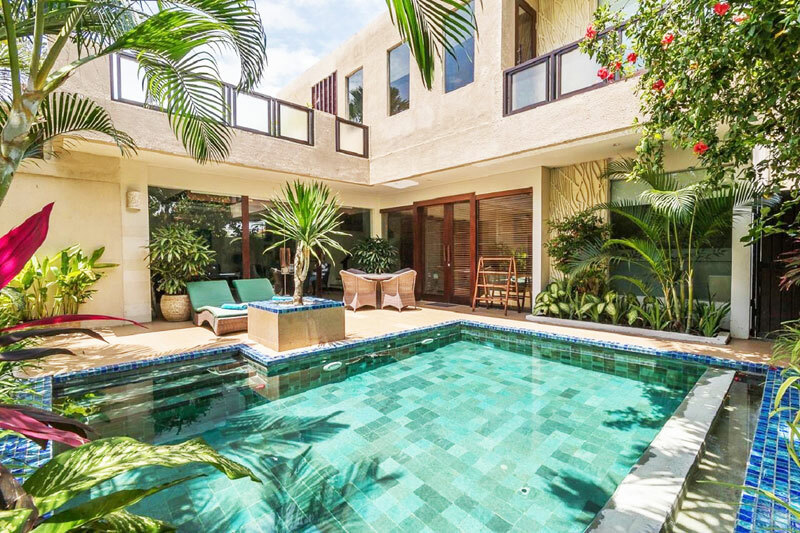 With fabulous decors, a gorgeous sun terrace, lush tropical garden and generous living space, this villa is all about high standards. 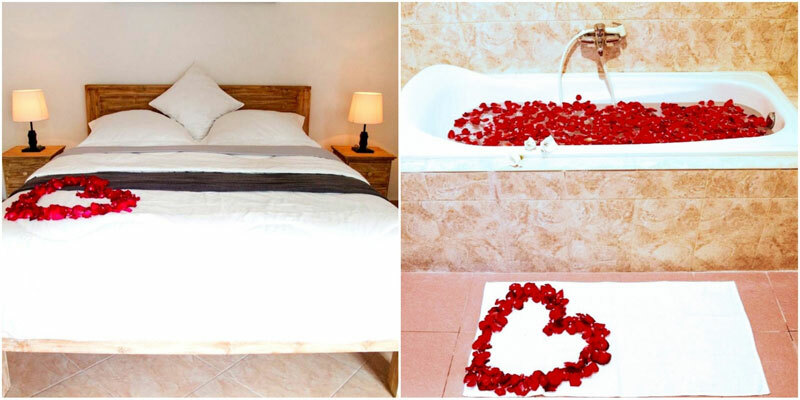 You don’t know the meaning of being spoiled until you’ve experienced this luxurious and romantic stay! Not only is the environment truly accommodating, everyone, from driver to cook and room staff, is always ready to give you a helping hand. Feel free to frolic around in a large space of your own, as Villa Lisha’s two villas both come with not one, but two bedrooms! 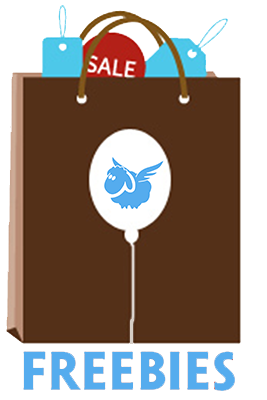 You might be thinking that you won’t need the extra one… but why not, when it’s still so value for money? 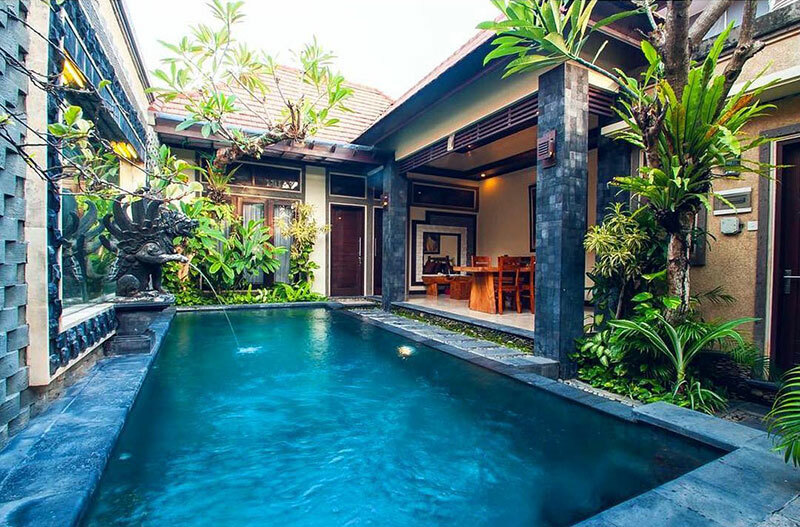 Located on the fringe of Seminyak, Villa Lisha is also just five minutes from all the beaches, restaurants, shops and more. All that extra space within your budget, with five-star service and location too? 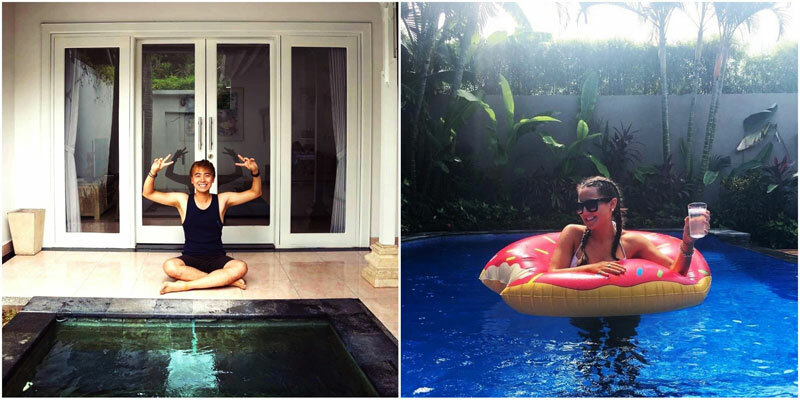 You’re a pair of lucky honeymooners for sure. We know how it is when you’re in the throes of passionate love – can’t bear to let your partner out of your sight for even a second? Want to spend your days basking in the light of their glorious face? 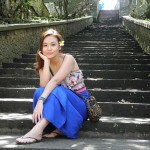 Danoya Villa is Da One for you. 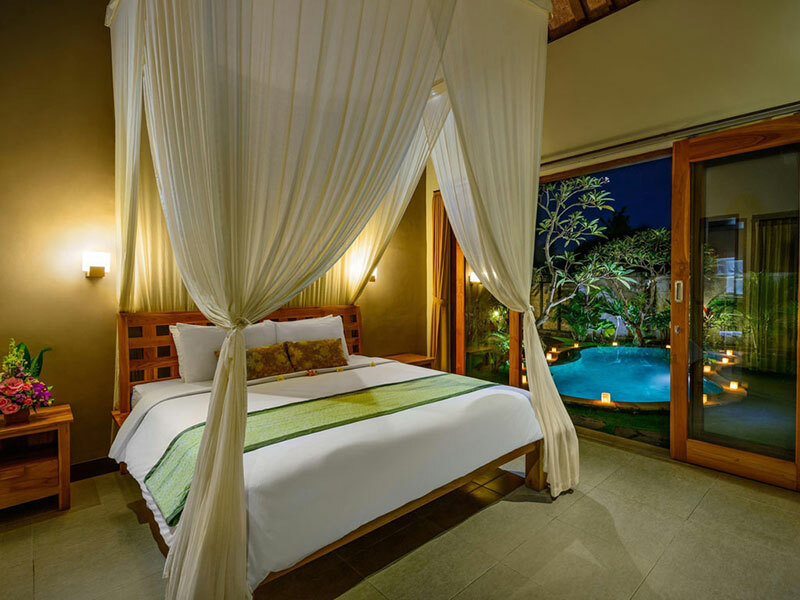 Inspired by a perfect blend of Mediterranean and Balinese style, this welcoming tropical villa comes with the most refreshing open concept architecture, where spying on your partner is easier than ever. Better yet, all the modern comforts you need are easily within reach. Not only is the villa fully air-conditioned, your personal pool is easily accessible, situated next to a lush garden and sunbed chairs. 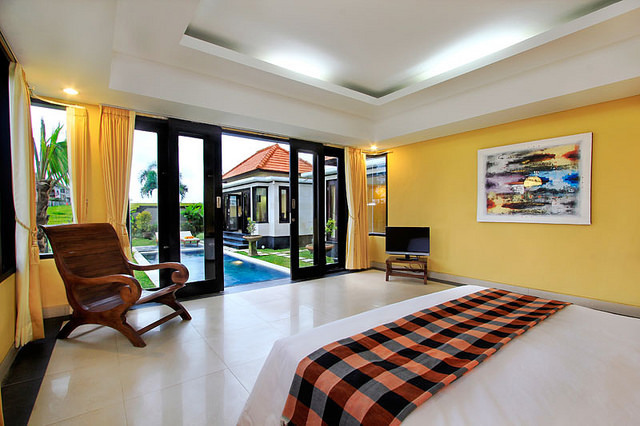 For honeymooners, the Imperial One Bedroom Villa is just what you need to begin your perfect romance getaway. Who says you need to go out to have fun? Sit back and relax in the roomy space, and make full use of the 24-hour facilities and semi-butler service! 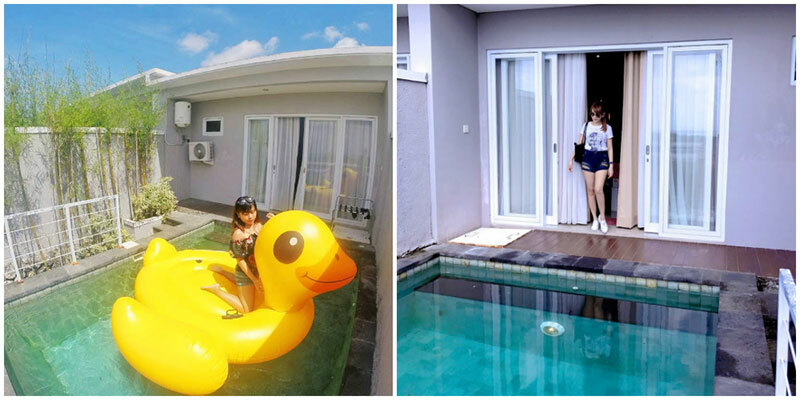 Other than the awesome accommodation, Danoya is also located at a strategic part of Seminyak. With the main Batu Belig road just a minute away, you just have to take a stroll to find all the best restaurants, such as Bebek Tepi Sawah Restaurant, and other entertainment options! 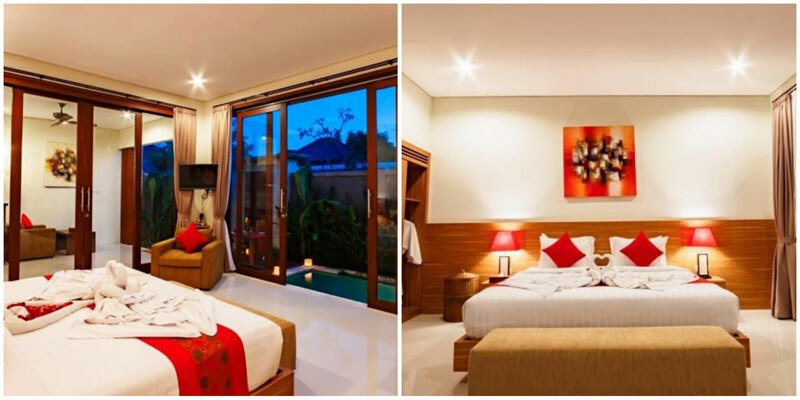 This family-owned villa is located just 1 km away from the beautiful Berawa beach, but you might not even want to step out of the cosy and tastefully decorated rooms. 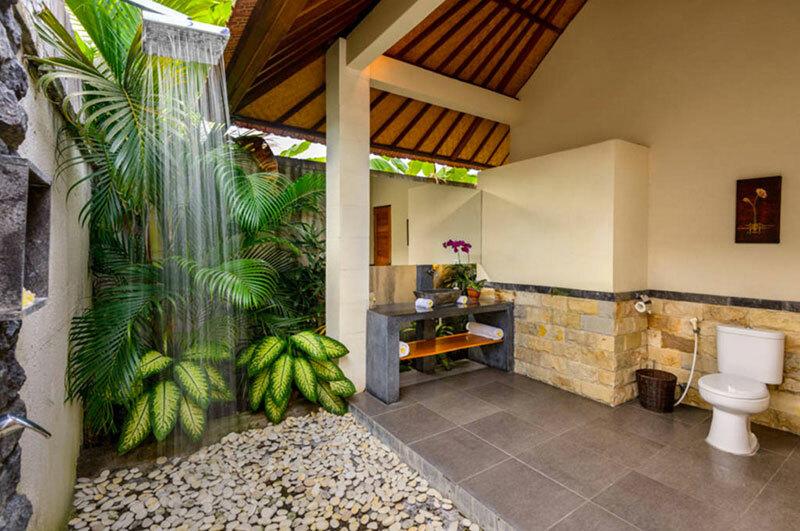 After all, you have everything you could possibly need in the villa – a private pool, a flat-screen satellite TV and DVD player, an ensuite bathroom with both a bathtub and a rainshower, and even a fully equipped kitchenette. 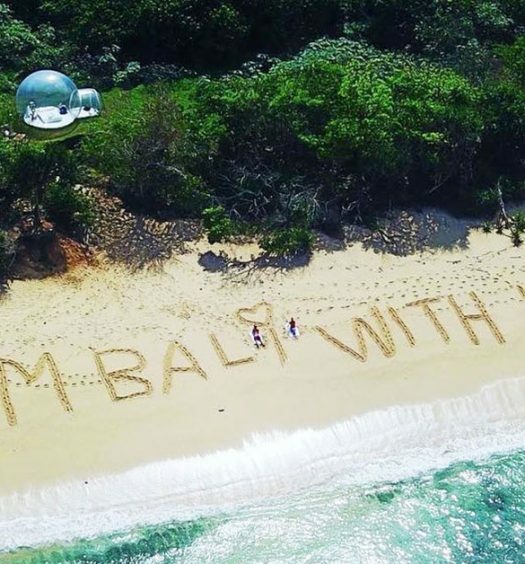 Who says you can’t honeymoon on a budget? Honeymoons are all about getting lost together in a world of two. 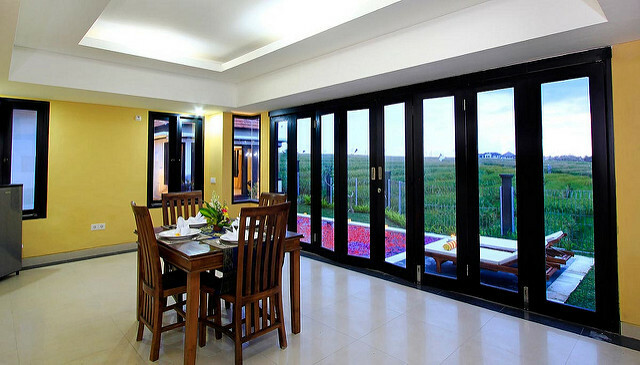 Not just any world, mind you, but a gorgeous one replete with a lush garden, inviting pool, sun terrace and bamboo walls. 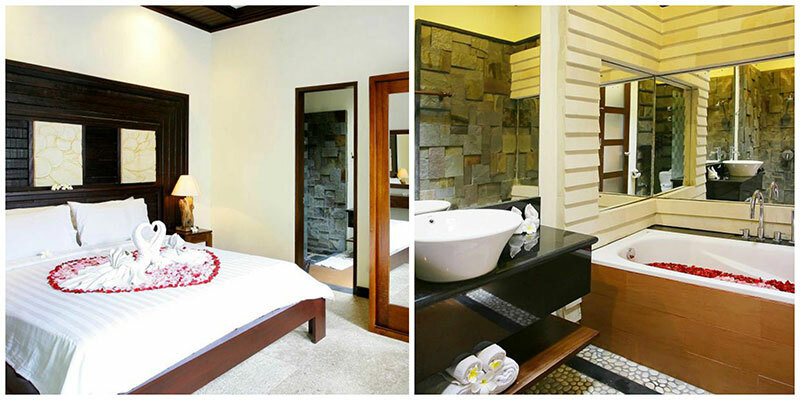 You can find all these in Kubal Villa, where your peaceful stay begins in their beautifully furnished villas. With one, two and four-bedroom villas available for picking, the level of luxury is all up to you. One thing’s for sure – no matter which one you choose, you’ll find a sanctuary made for two complete with all the modern facilities you need. But paradise doesn’t necessarily have to be tucked away from the world! 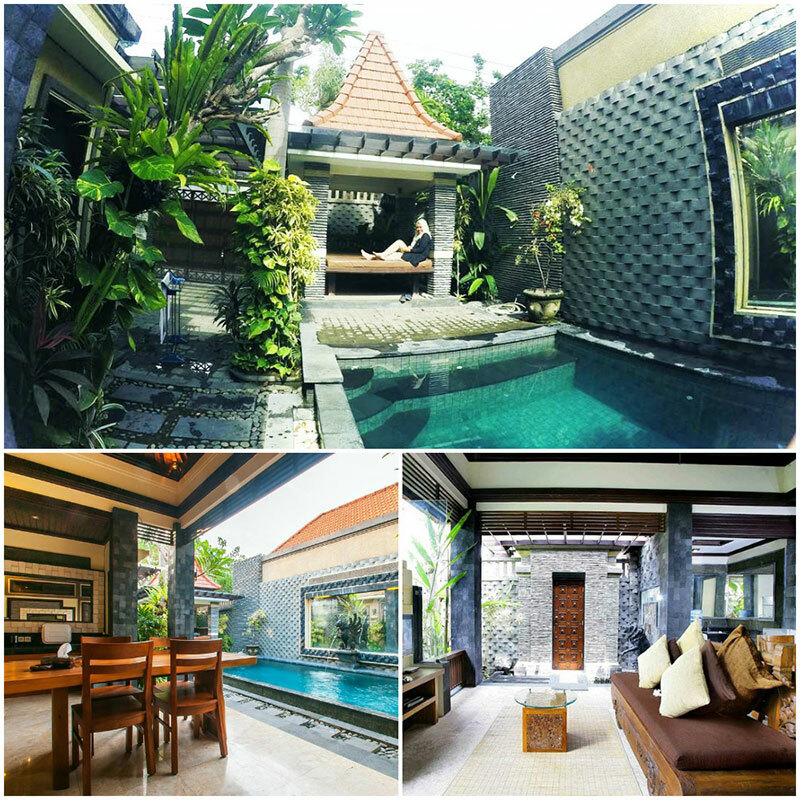 Jump back into the real world any time you want, as Kubal Villa is located right within trendy Seminyak. Even the laziest couch potato won’t be able to bemoan the one-minute walk to the beach, and other popular attractions such as Woobar and Potato Head Beach Club are perfectly explorable by foot too! The staff is beyond friendly but not intrusive – so you’ll have all the privacy you need. 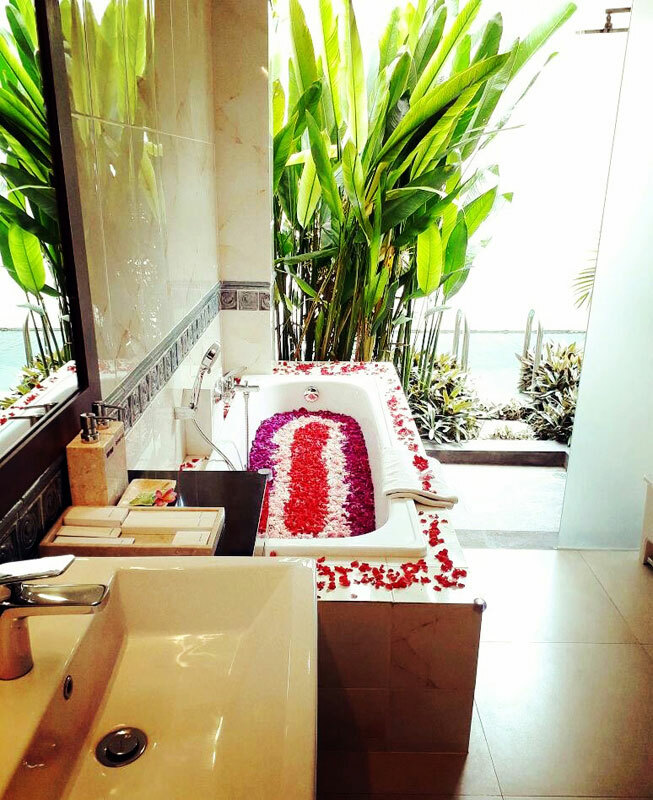 Whenever you feel like spicing up your honeymoon, simply call upon them for free pick ups to nearby locations, a free massage, and any special breakfast request that’ll sweeten your honeymoon to the max. 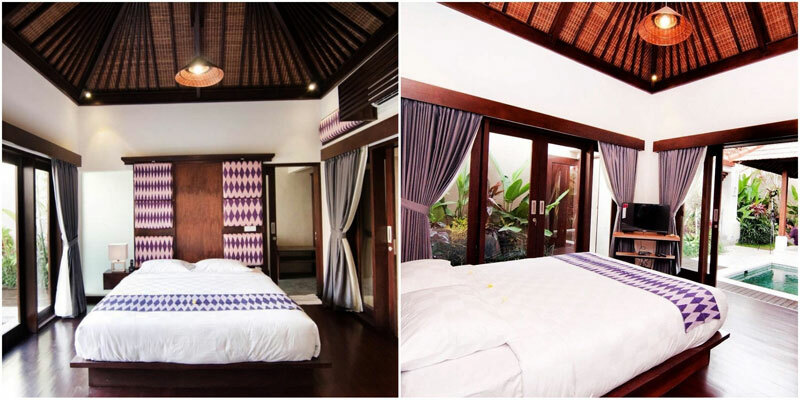 Get ready to fall in love all over again, not just with your partner, but this time – with a dreamy hidden villa that goes by the name New Pondok Sara. 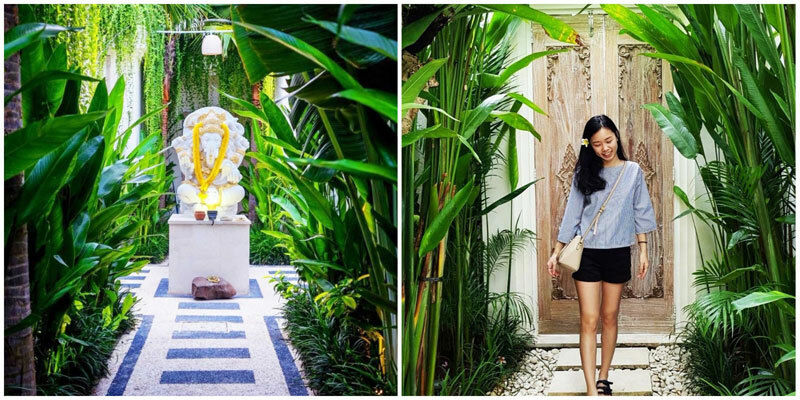 As soon as you come into the lush pathway that leads to double doors, there’s no denying that tranquil and romantic atmosphere. 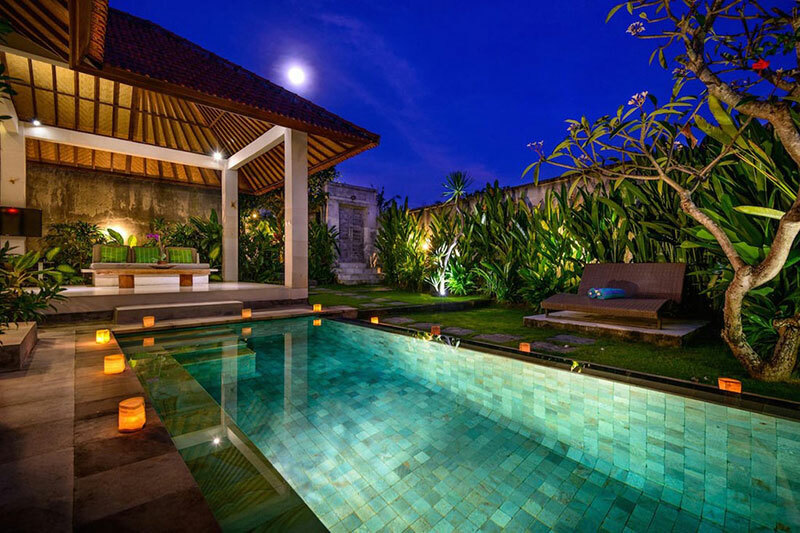 Step right into the quaint property where gorgeous villas are waiting with their decent pools, private terraces and a tropical landscaped garden. 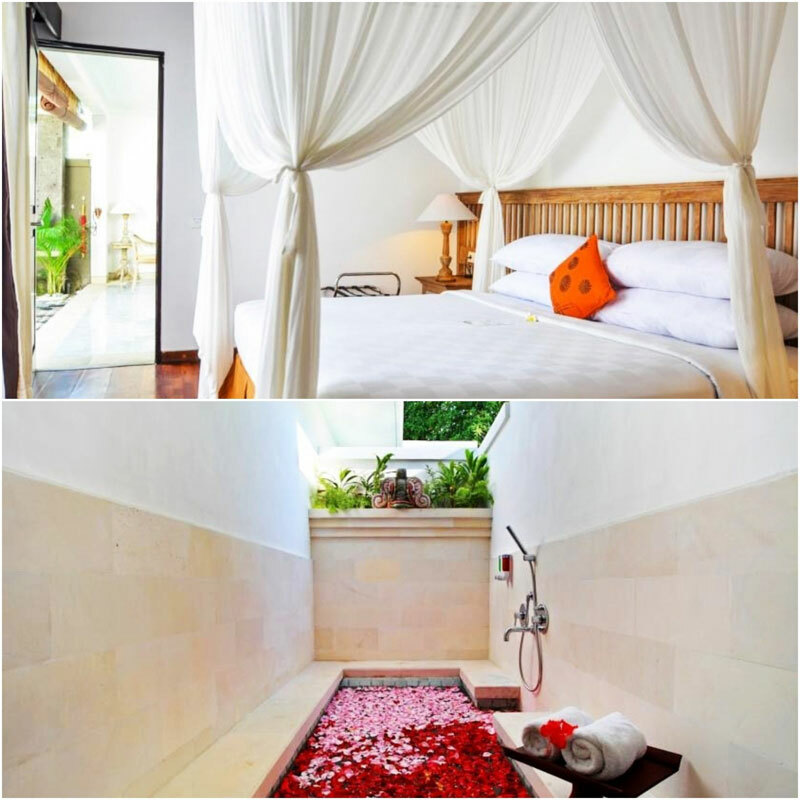 Most favoured by couples, this villa offers a romantic staycation of your dreams with easy access to Seminyak too! 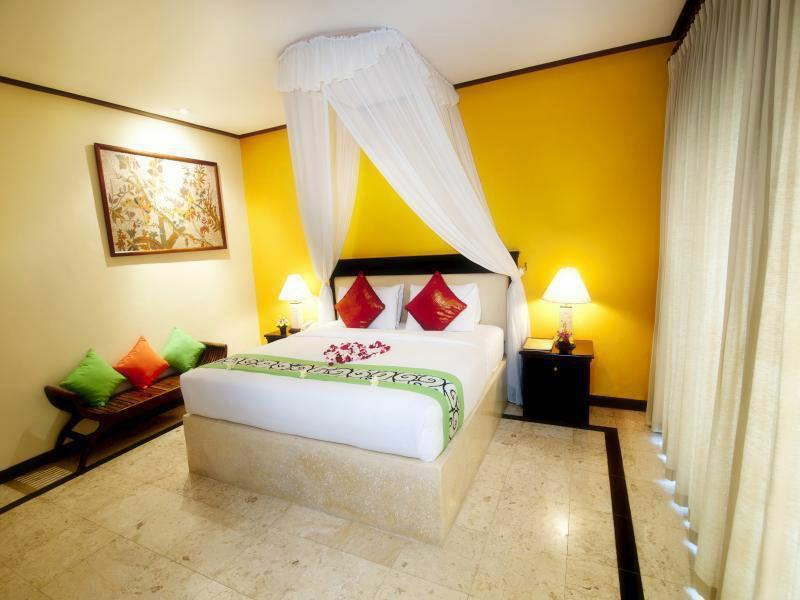 Just 10 minutes away from the beach and Central Seminyak, it’s a combination of romance and play at its best. Just be careful not to fall in love with the staff too. From delivering your selected breakfast and rushing to fulfil your every need, the service here will have you feeling more pampered than you’ve ever been. Time to buck up, other half! What’s romance without a touch of luxury every now and then? Aishwarya’s name is derived from the Sanskrit word for “prosperity”, and that’s exactly what it offers – in a place so luxuriously romantic, it’s almost hard for love not to prosper. 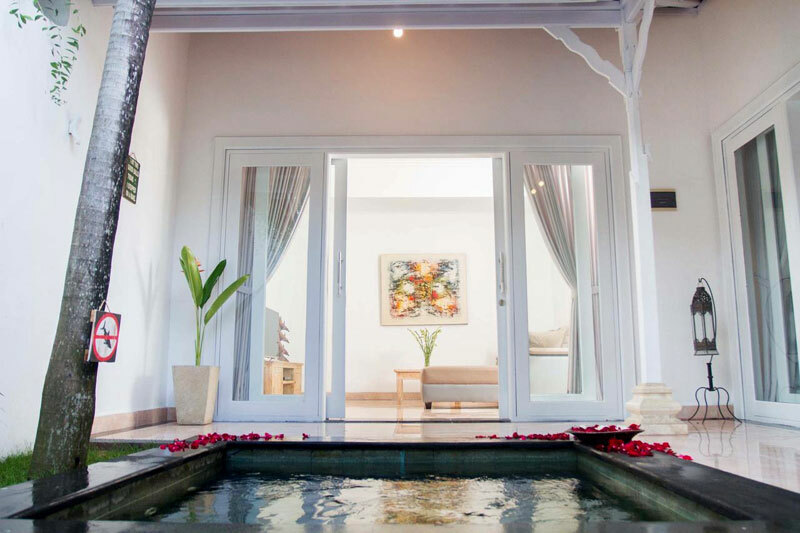 Get in touch with your inner king and queen as you step into the comfortable and secluded villa complex, which offers 17 one-bedroom villas with private pools. 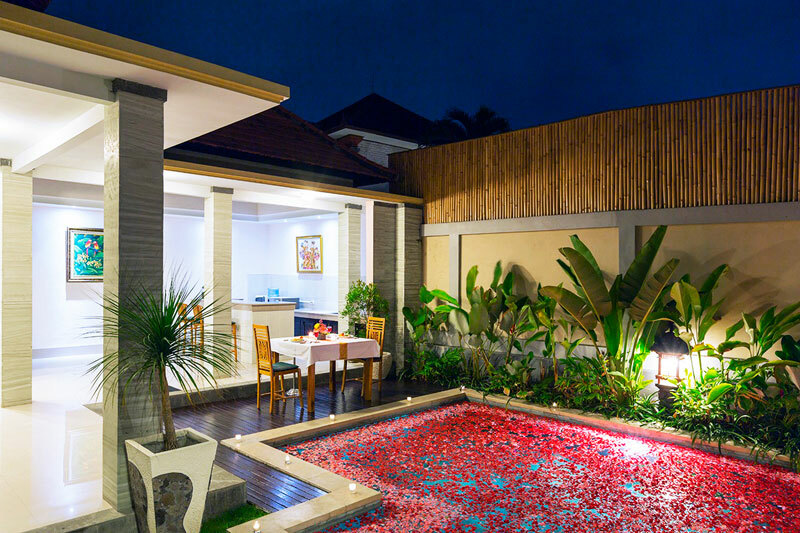 Decorated with a touch of local artistry, all their modern villas convey a serene atmosphere and unique Balinese vibe. 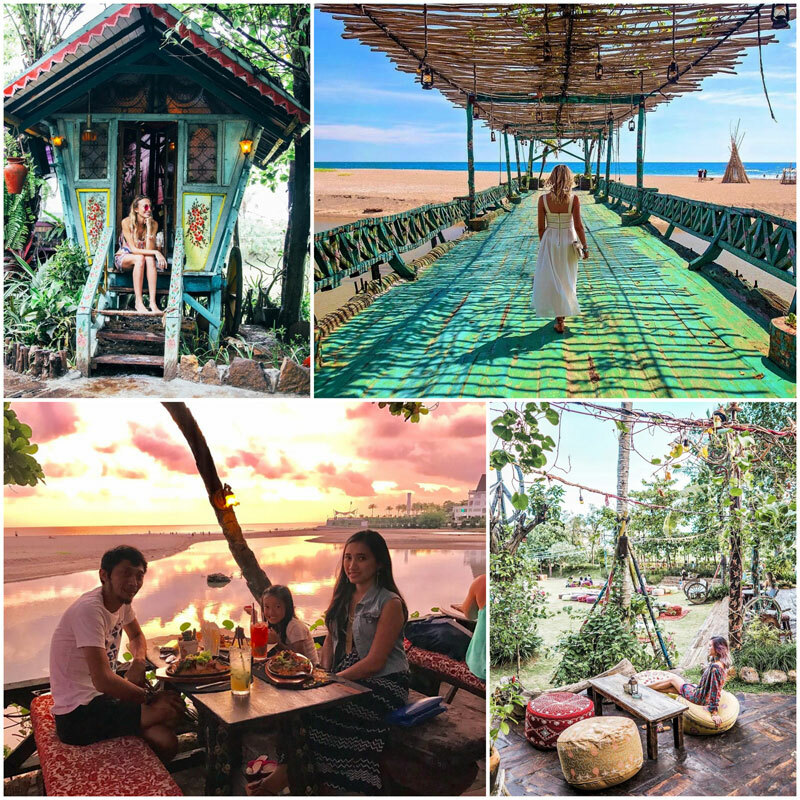 Your island adventure is completed with scenic frangipani trees, minimalistic gardens and traditional adornments that will make you feel like you’re in another world! 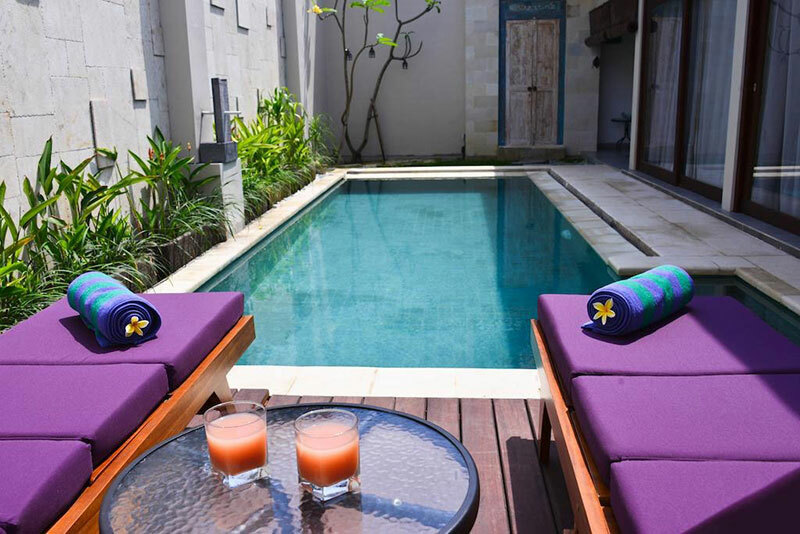 While located in a quiet part of Sanur, the villas are still very convenient and the hotel gladly provides scooters and bikes for your convenience too. 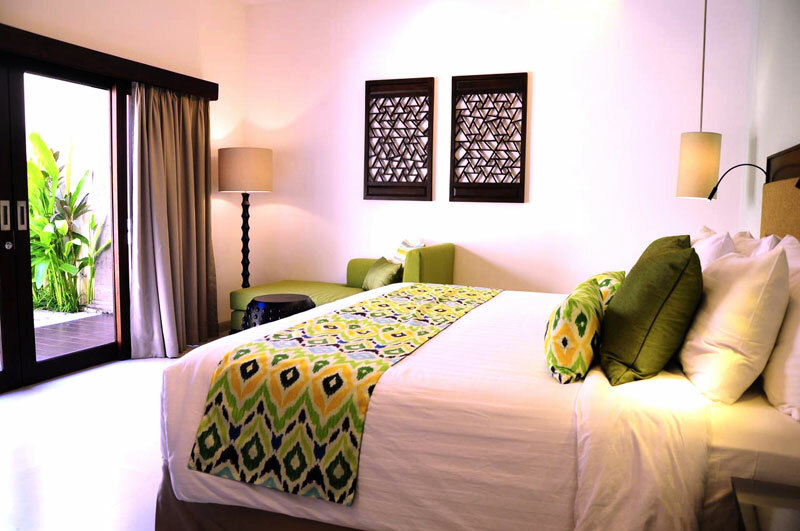 With an affordable price tag, you now have more to splurge on other aspects of your honeymoon! Can’t wait to begin the rest of your life with your other half? Start “playing house” right away at Villa Viona 6 Oberoi. 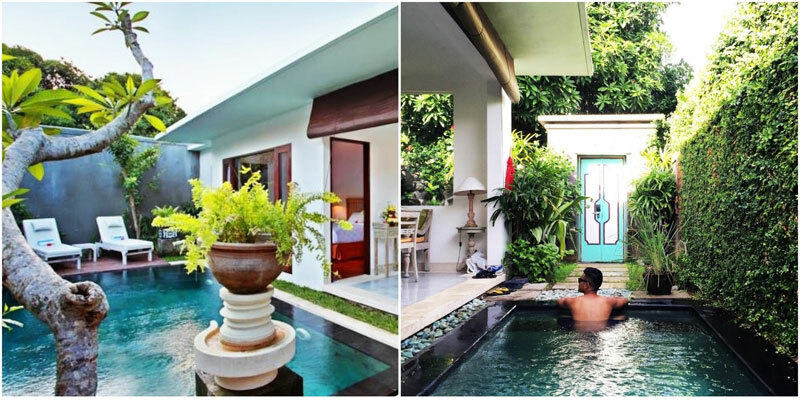 A charming little house with a small kitchen, separate living room and bedroom, plus a decent pool out front, Villa Viona 6 Oberoi boasts an effortlessly clean and minimalistic look. It’s all about the clean wooden furniture and a homey vibe that you’ll adore. 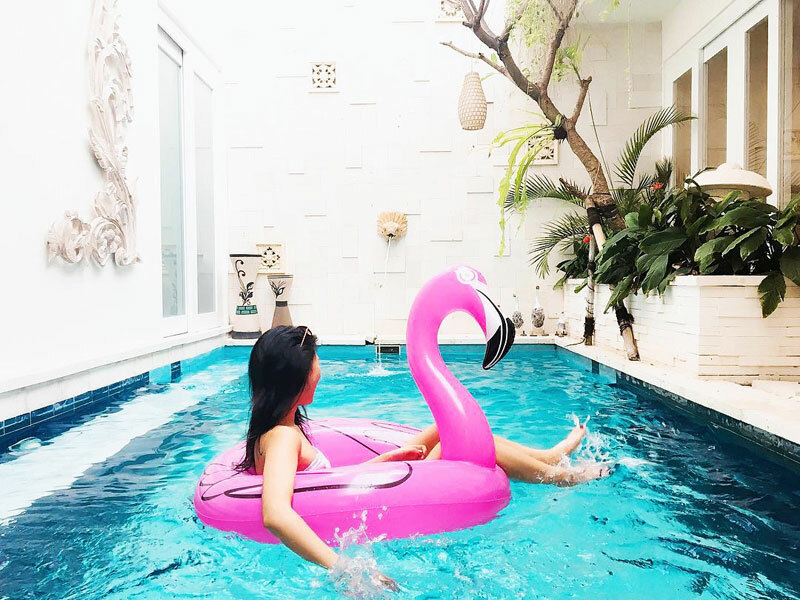 Located down the chic Oberoi road of Seminyak, you’ll enjoy direct access to the best entertainment in the heart of Seminyak, from nightlife, happening bars and restaurants, to a gorgeous boutique strip and the beach – all of which are just mere minutes away! There are other accommodations that go by the name “Villa Viona” but are marked by a different number, such as Villa Viona 3, 4 and 7. 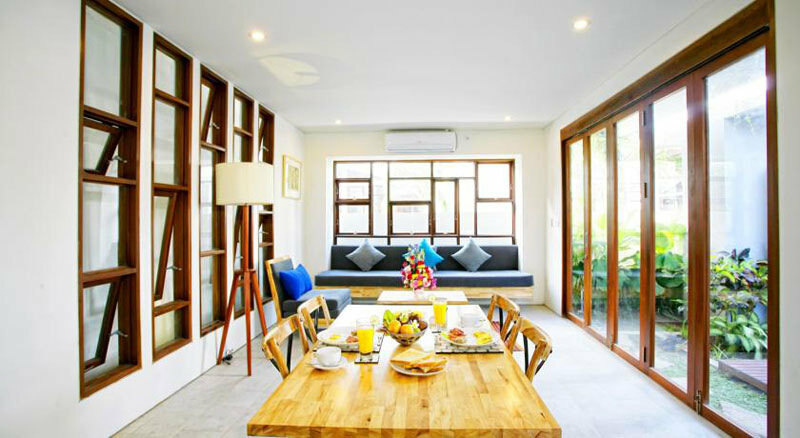 These are family-friendly villas, so be sure to book the right one for the perfect house for two you never knew you could have! 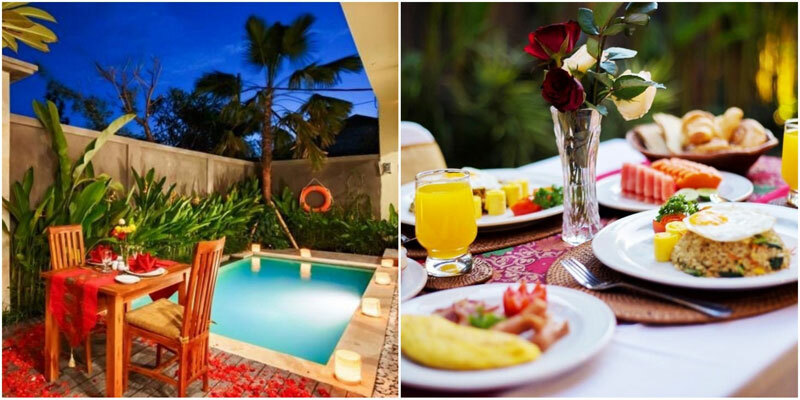 If you think that sunsets are a must-have in any romantic itinerary, chances are you’ll love Villa Puspa. 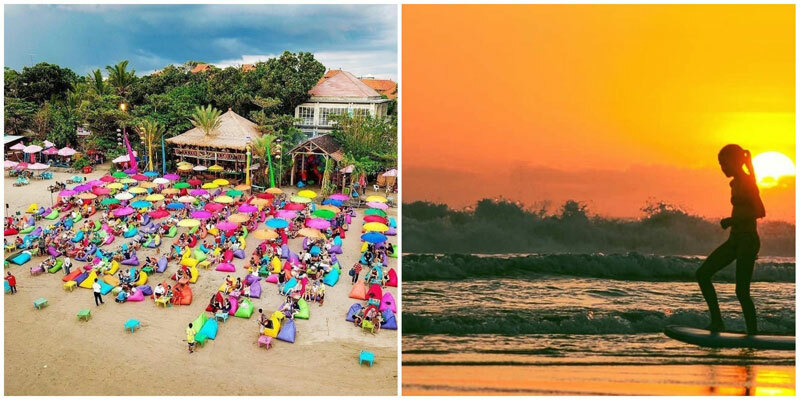 Situated in the focal part of Tabanan and near the relaxing Kedungu Beach, one of the best surfing beaches in Bali, Villa Puspa offers a unique love paradise with its close proximity to Tanah Lot Temple, one of the most famous sunset spots on Bali Island. With gorgeous sunsets just a mere five-minute drive away, what else could make your honeymoon any more perfect? Oh yes, there is – getting there is oh-so-easy thanks to Villa Puspa’s friendly staff, who’ll arrange free rides for you when you need them! 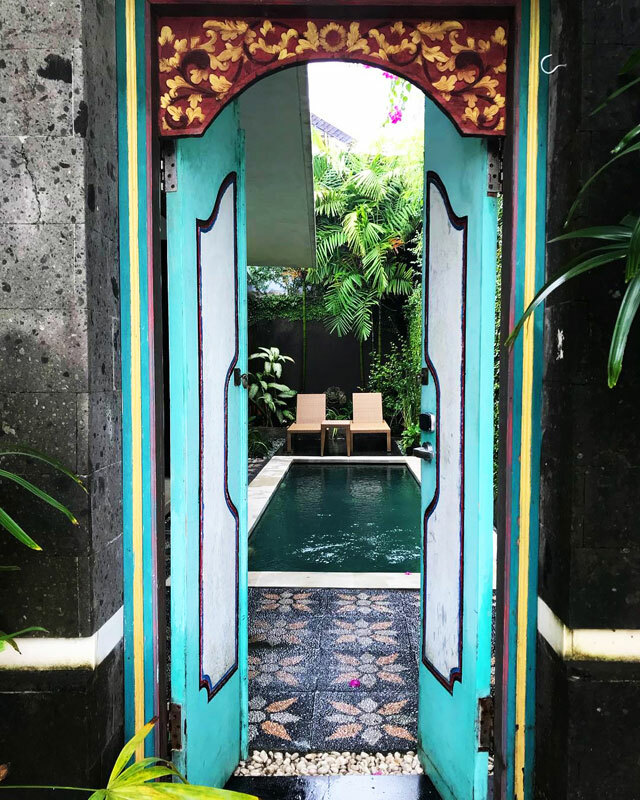 When you’re done admiring nature’s art gallery, you get to return to your very own, as Villa Puspa is a complex that mimics a Balinese art gallery. 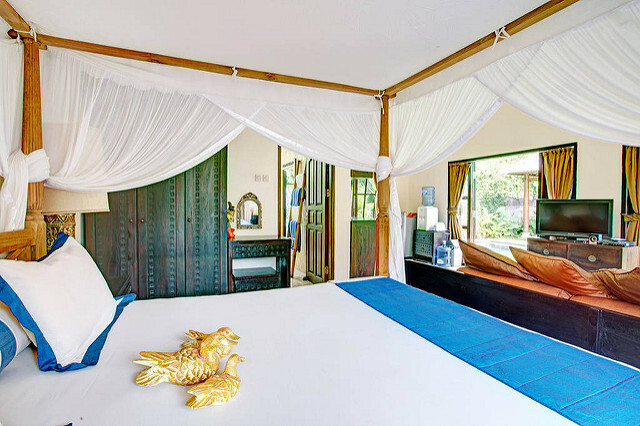 Decked out in traditional and tropical themes, each villa offers a stylish sense of traditional living that’s unique and cozy. With a lush garden, refreshing pool, an open kitchen, large bedroom and more, you’re promised a honeymoon retreat where you can just laze and play to your heart’s content! 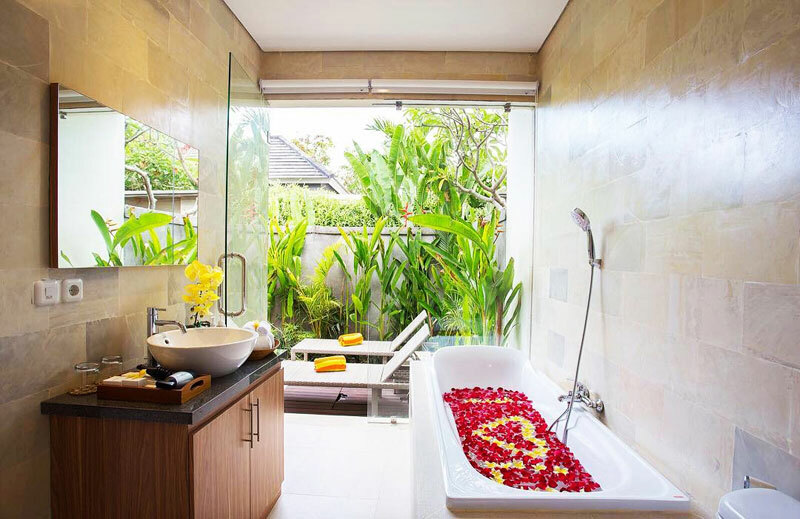 Luxurious European fittings, Balinese artwork and an elegant living space – it’s love at first sight when you step foot into D’Wina Villa Canggu. This love abode boasts a crystal blue pool with tall beige and white walls all around. Shaded by tall trees and artistic decors, complete privacy is yours as you feel completely at home in this cozy atmosphere. 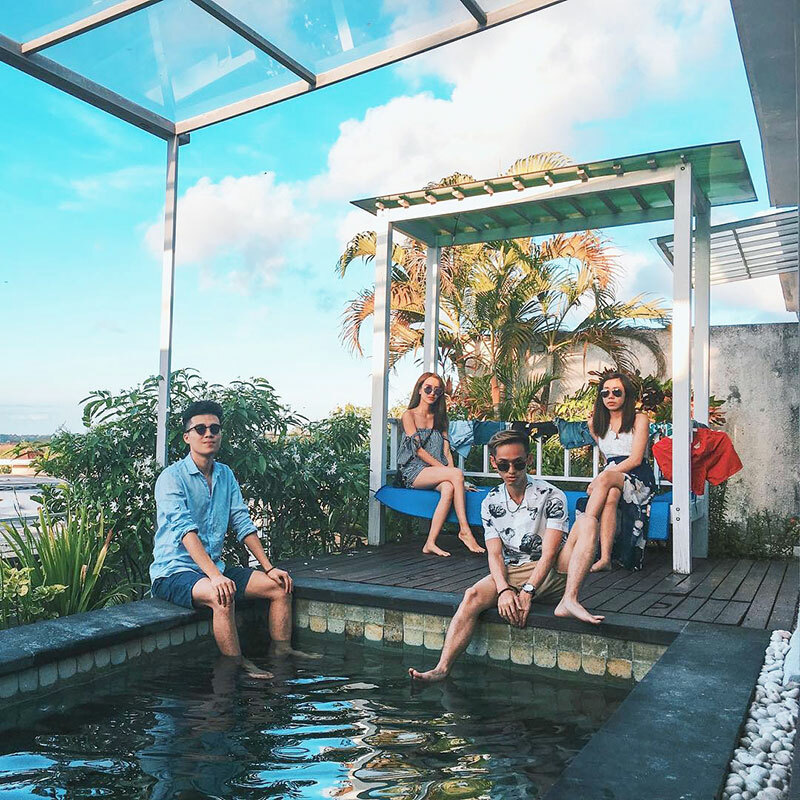 It’s another plus point that you’ll never be bored here, as D’Wina is just a comfortable 15-minute walk away to Canggu and other entertainment options such as La Laguna Bali. 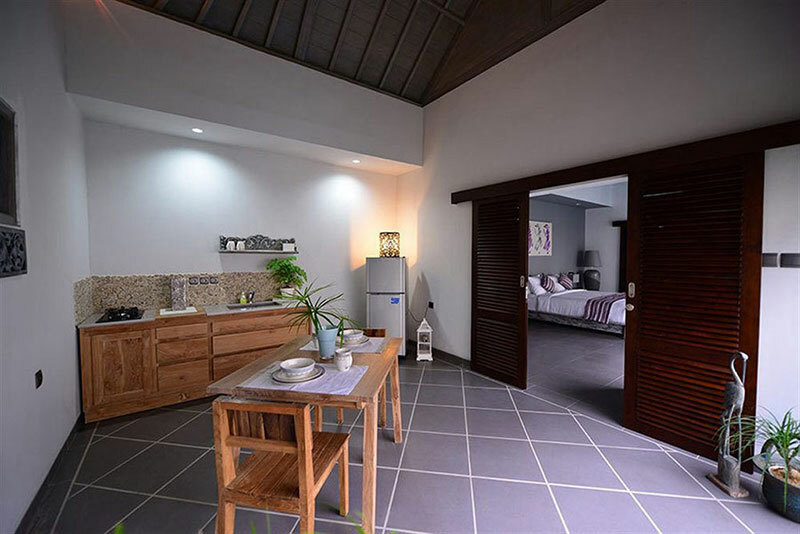 Of course, we understand if you don’t feel like going out – this relatively new villa offers one- to three-bedroom accommodation types that each come with a King size bed, private pool, kitchenette, dining area and bathroom with a bathtub. Who needs the outside world when you have your loved one and everything you could possibly need? 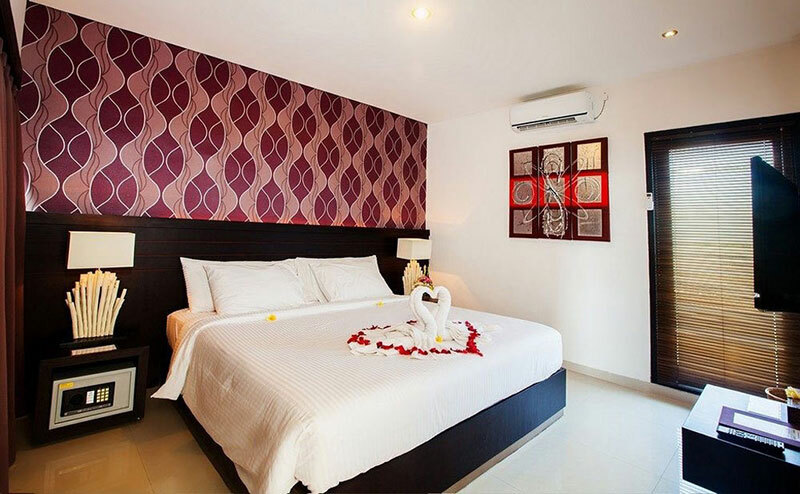 With such an affordable price, sincere service and a strategic location, D’Wina is set to be the budget stay that will make your honeymoon… D’Wina (hur hur). Sun, Sun, Mr Golden Sun, please shine down on me~ If this is your favourite song, Puri Mesari will make all your sunny dreams come true. 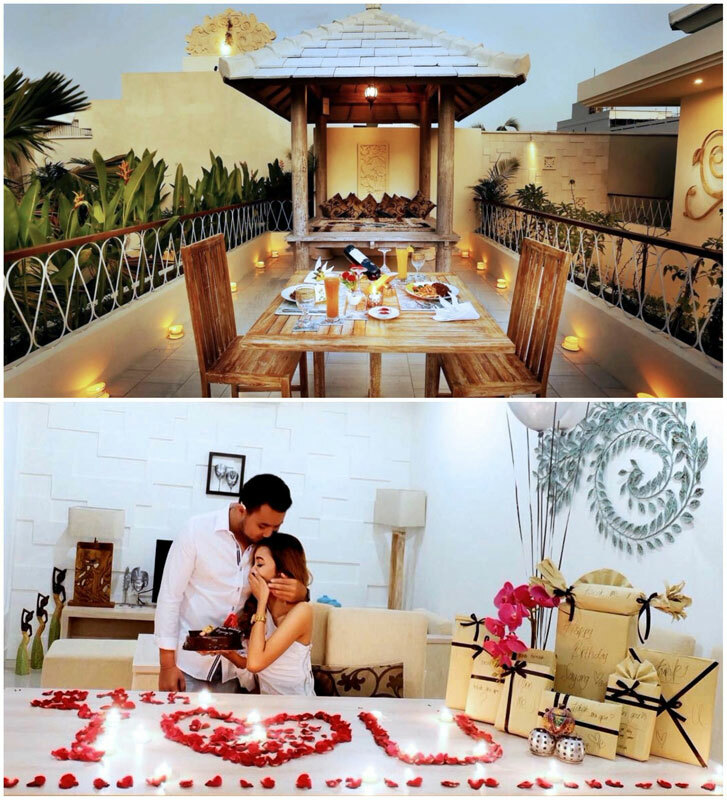 The open-concept villa at Puri Mesari is perfect for adding that golden glow to your honeymoon… literally. We’re talking about an outdoor bathtub, oversized swimming pool in the garden, and lounging spots under the sun – but fret not, the tall wall and trees provide just the right amount of shade and privacy for two! 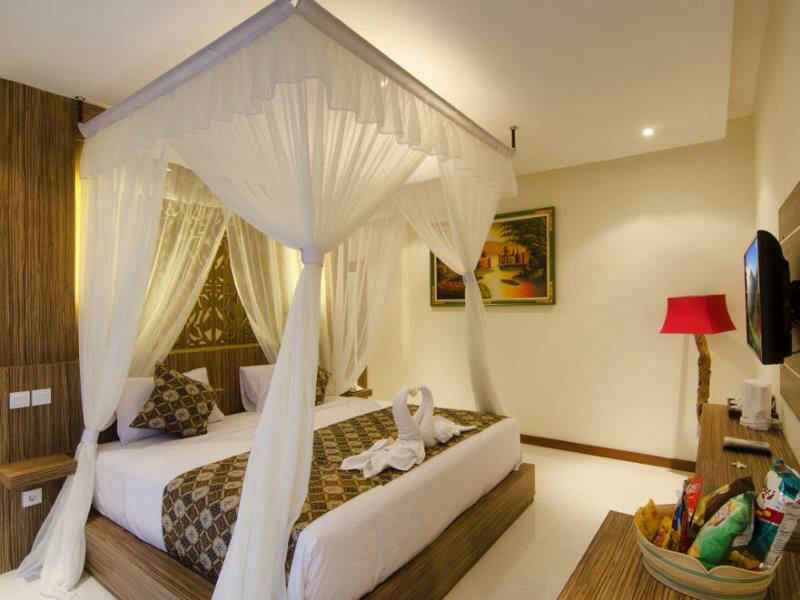 Located at the southern part of Sanur, where the white sandy Mertasari beach and Mount Agung can be found, there are two types of Puri Mesari accommodations to choose from: an intimate family-run hotel with 21 rooms and a complex of five suites, both located just five minutes away from one another. 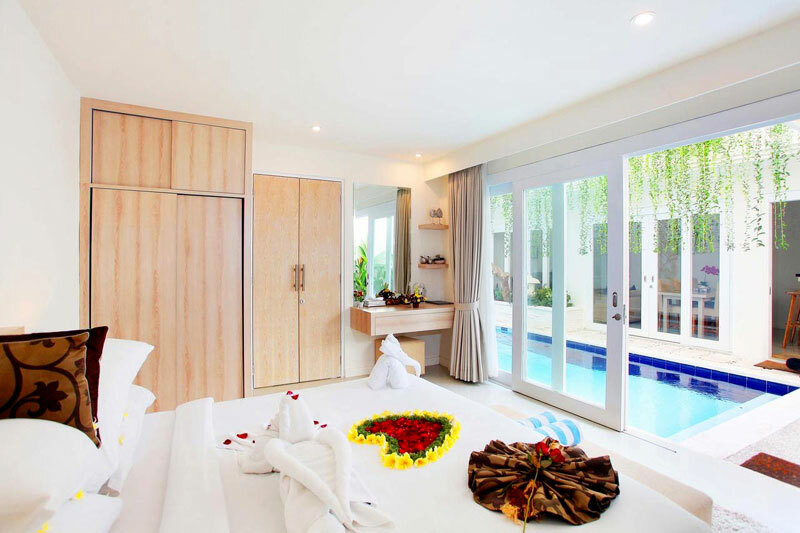 Managed by a professional hotelier, you can expect highly immaculate service in your spacious minimalist villa. 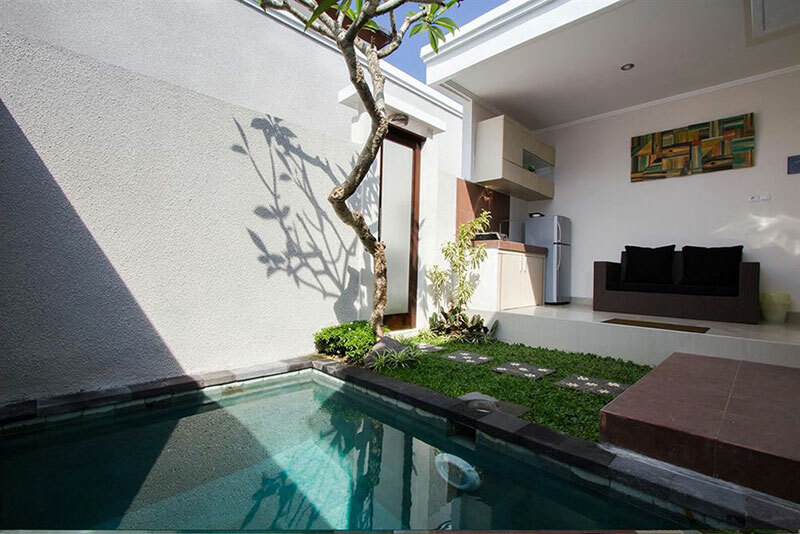 You can either enjoy the privacy of your villa, or stroll around to the beach while taking in the charming and well-established Sanur area. Or, you can get a tan right within the privacy of your own villa! That sounds about good to us. 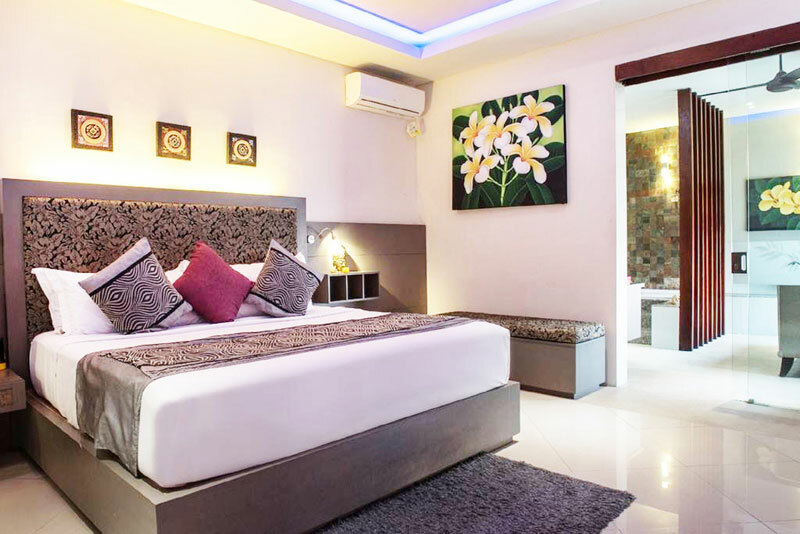 With such spacious rooms, a private terrace and comfy beds that define the epitome of luxury, it’s hard to believe that staying here won’t burn a hole in your wallet. 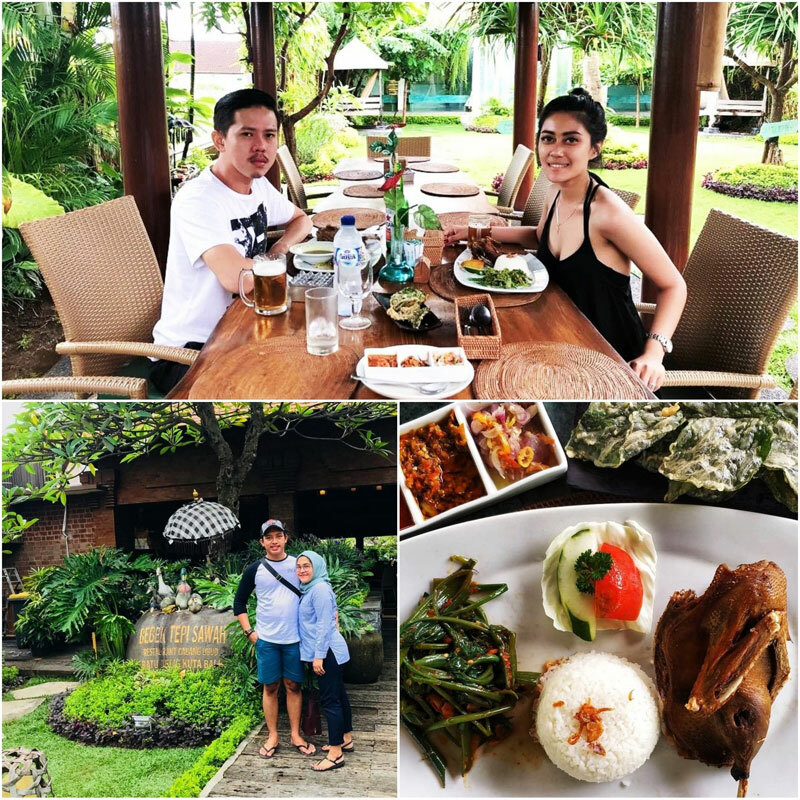 Usually, we would say that there’s no free (in this case, cheap) lunch in this world, but The Widyas Bali Villa just happens to be the exception to that rule. 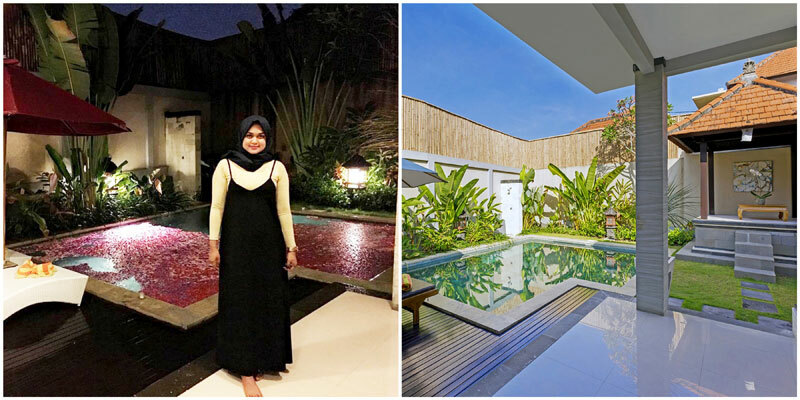 This private villa is all yours to be enjoyed – yes, even this gorgeous swimming pool that could probably keep you and your loved one occupied for a whole day. But we frown upon sedentary lifestyles (ironically, sitting before a computer screen). That’s not something you’ll have to worry about here, though, because you’ll even have a fully equipped gym with smashing views! Who says great honeymoons have to leave you in debt for the next hundred years? Definitely not us. 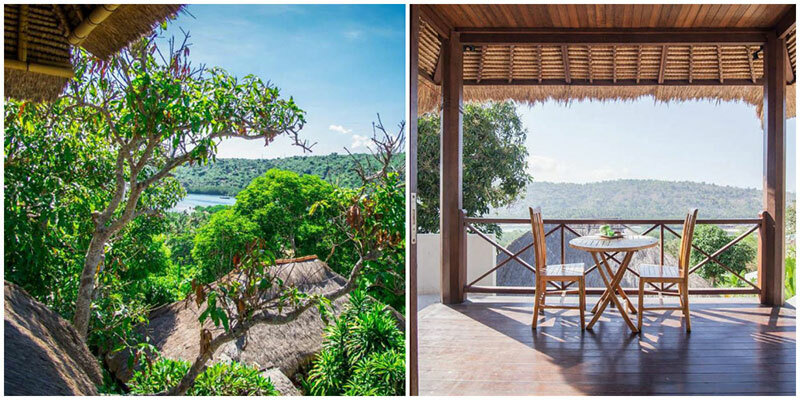 At this private and romantic villa, you get to enjoy magnificent views of the ocean and rice fields from the comfort of your room. Enjoying the sunset with your significant other will never be the same again. 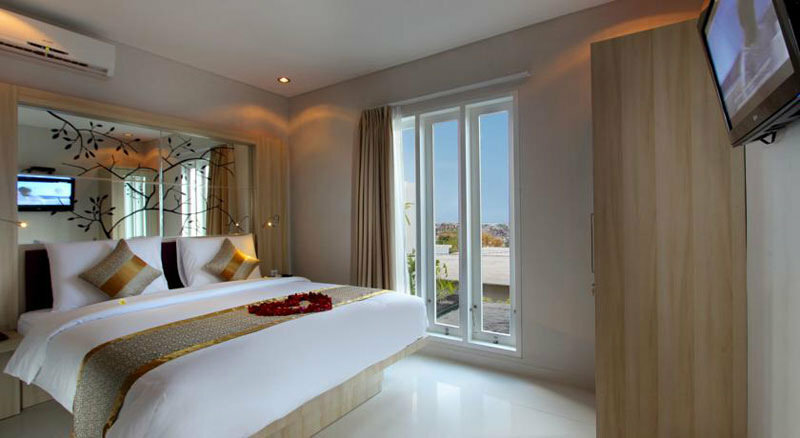 To make the most of the beautiful views, Pande Villas is equipped with floor-to-ceiling windows, so you can wake up to the sunlight streaming in in the morning. 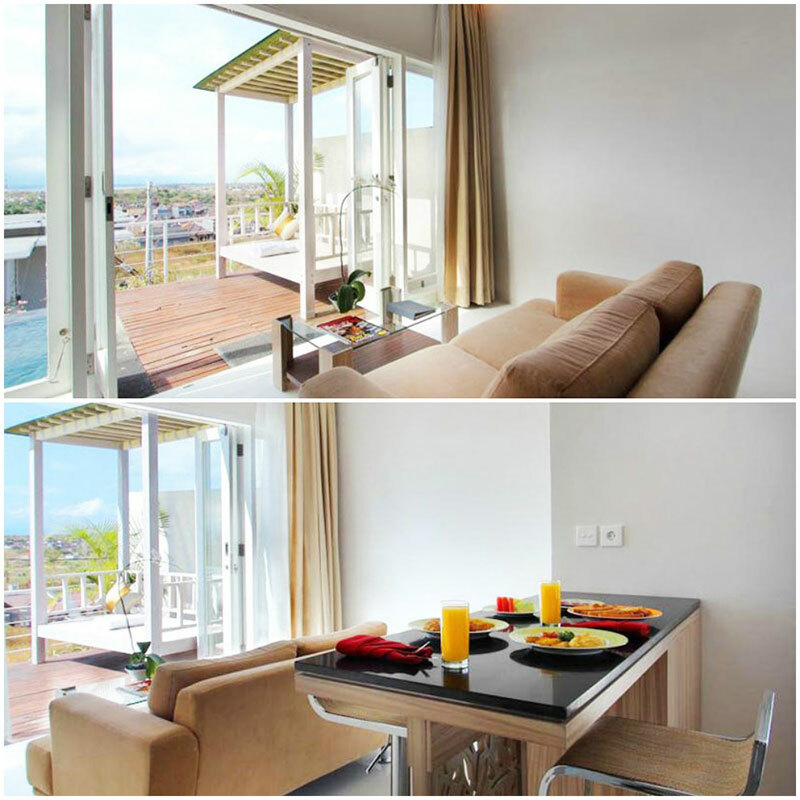 The spacious interior is also complemented with your very own terrace and pool. And if you can finally pull yourself away from such a luxurious and relaxing retreat, you can take a stroll down to the Mengening Beach, which is just five minutes away by foot. 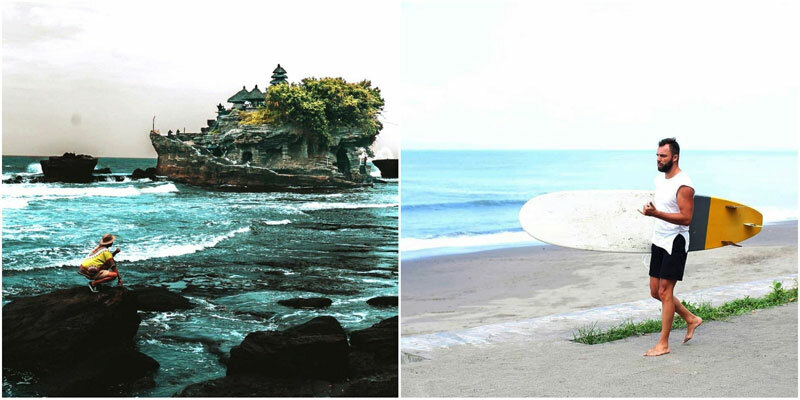 If you want to explore more, the Echo and Balian beaches are just a 15-minute drive away, while the legendary sea temple, Tanah Lot Temple, is a 20-minute drive away. Who says you can’t pamper yourself and sightsee at the same time? 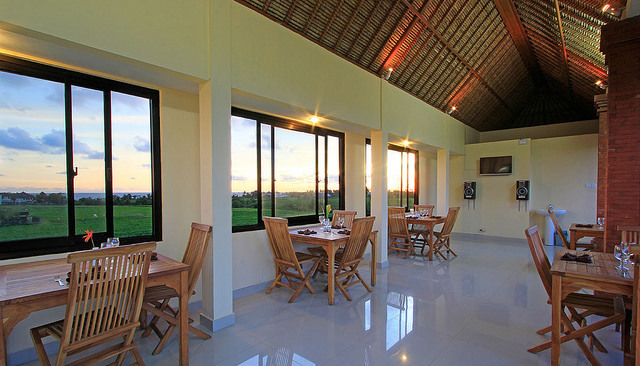 Note: Recent guests have given feedback that this villa is not very well-maintained, food at the restaurant might not be great, and there might be a concern of insects as it’s near the paddy fields. 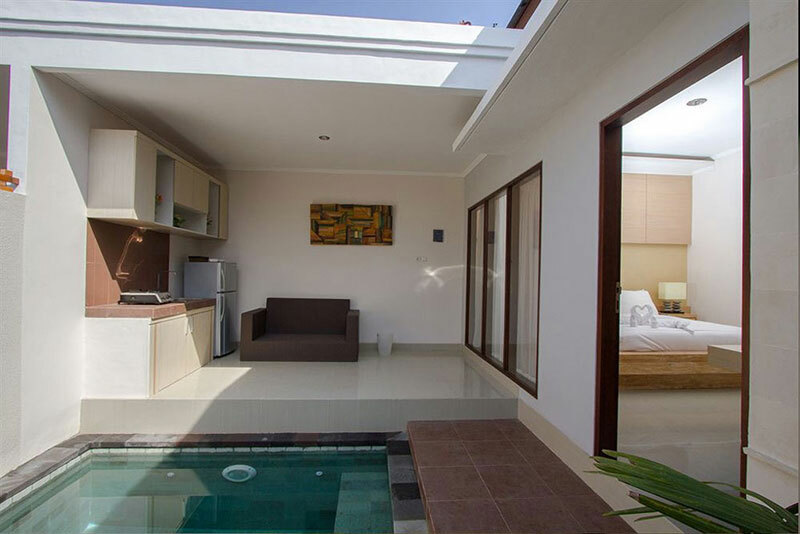 This villa is also not located close to the city, so please bear these in mind before you book. Filled with wooden tones and accentuated with a touch of gray, this spacious villa brings luxury into a contemporary, Scandinavian-style interior. One step into this classy abode, and you’ll feel like you’ve gone into the world of IKEA catalogs. 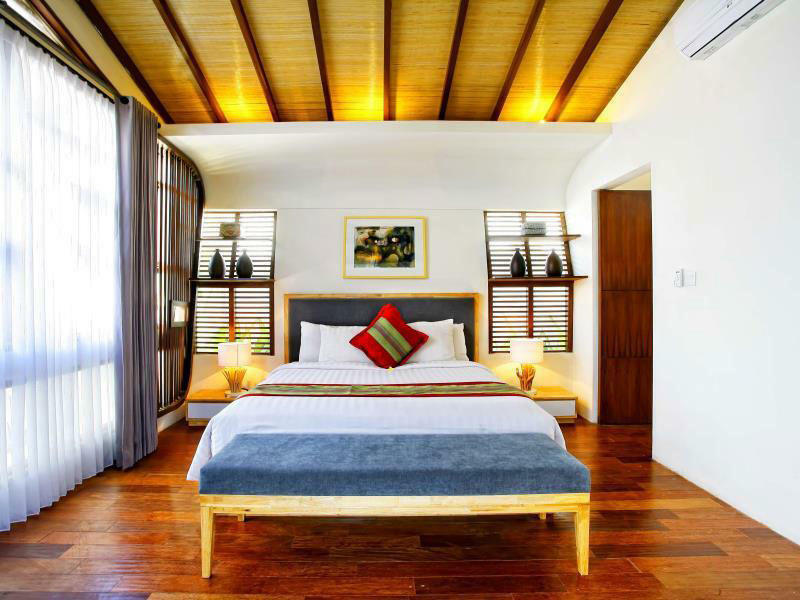 Feast your eyes on the stylish wooden floors reminiscent of European cabins, and laze your days away in the swimming pool. Your life of luxury will be made complete with a wooden deck and beanbags to lounge on while enjoying a glass of cocktail. 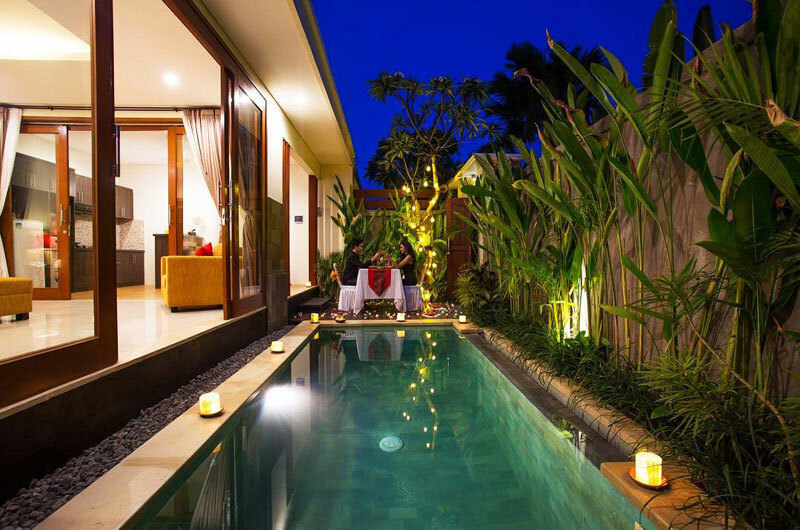 Never let it be said that The Royal Bali Villas Canggu doesn’t pamper its guests enough. Even the bathroom here is one that attracts awe. Imagine sinking into a bubble bath in the huge bathtub – will you ever want to come out again? Wait, we’re not done yet. 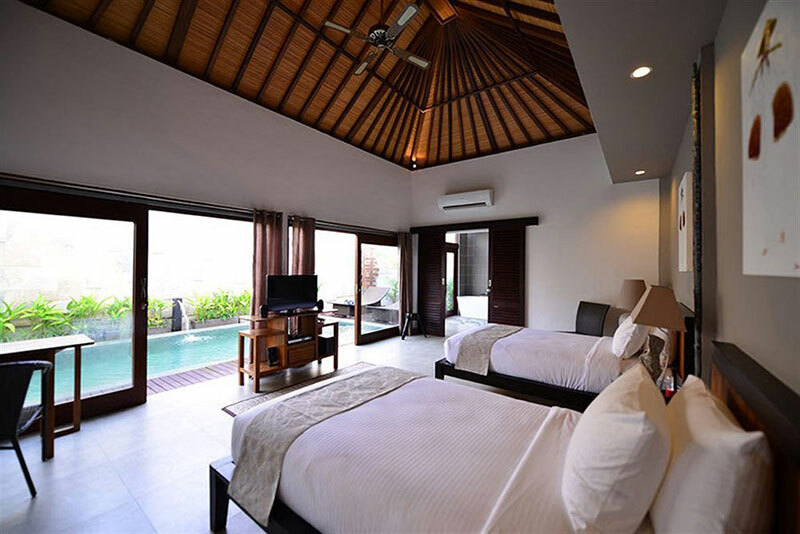 This villa is also located right on Berawa Beach, which is known for a wide variety of hip cafes and restaurants. Other than taking a culinary tour, you can also enjoy a day of fun at Finns Recreation Club with a day pass. 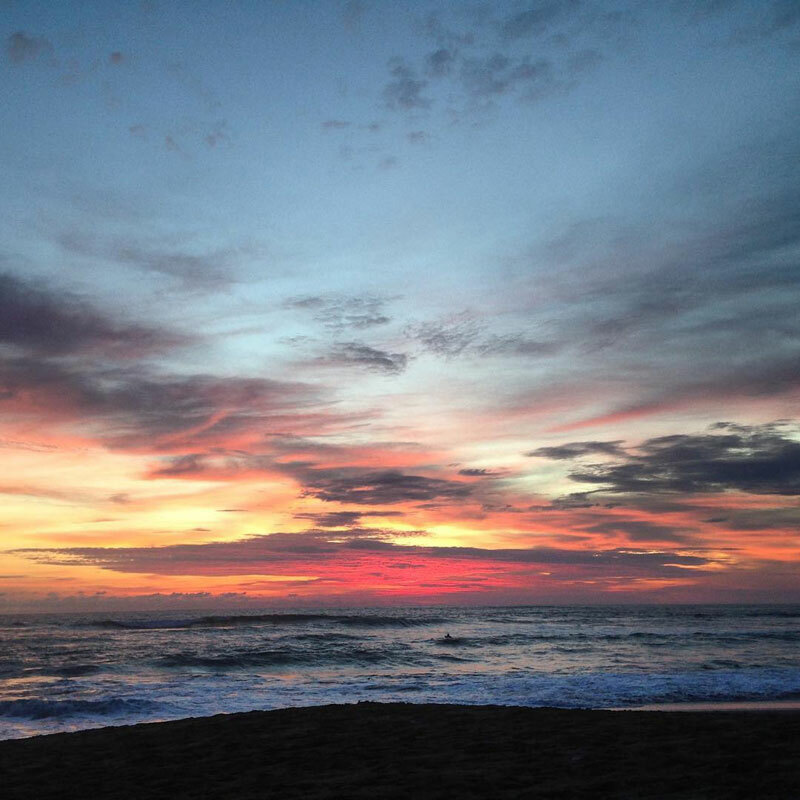 If that’s not enough to impress you, try camping out for the sunset at Batu Belig Beach, which is only 10 minutes away, or travel only a short 15 minutes to check out Echo Beach and Batu Bolong! 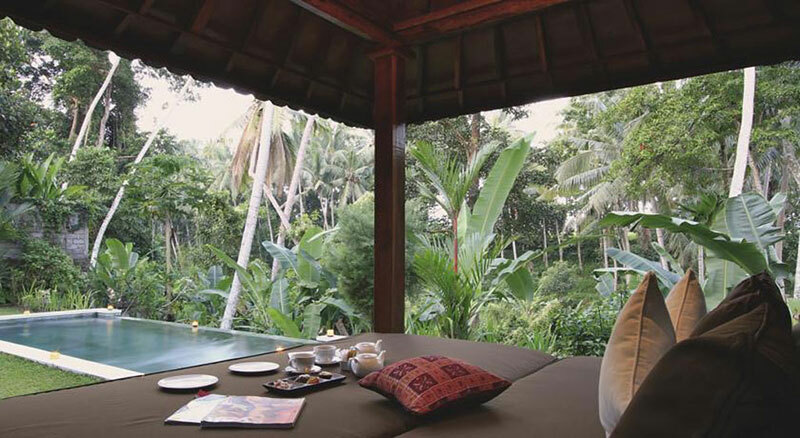 If your dream honeymoon is set among Ubud’s lush paddy fields and cool mountain air, you may want to take a closer look at this villa. 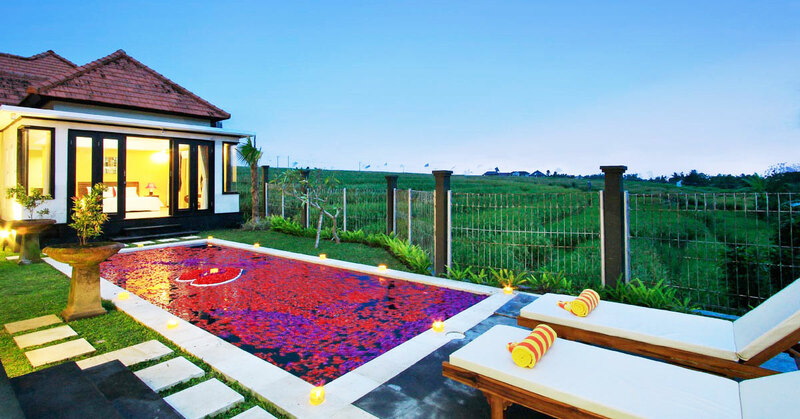 It may not look like much when you see it across the paddy fields, but it’s actually a spacious two-storey villa with two bedrooms. Check out the pool and four poster bed! Can you believe that this is actually a budget villa? 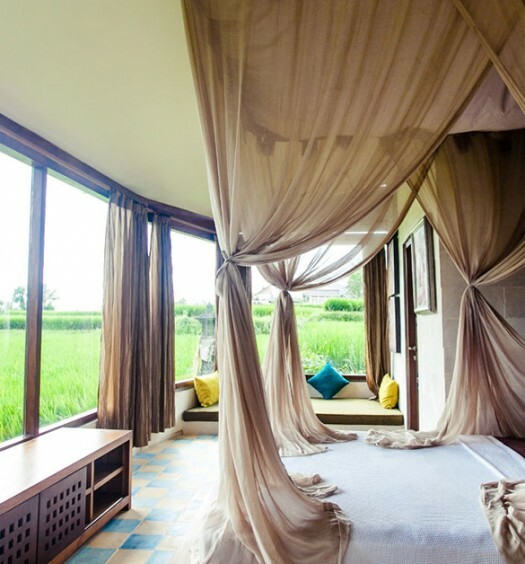 The wide picture window beside the sunken bath opens to a view of lush paddy fields. 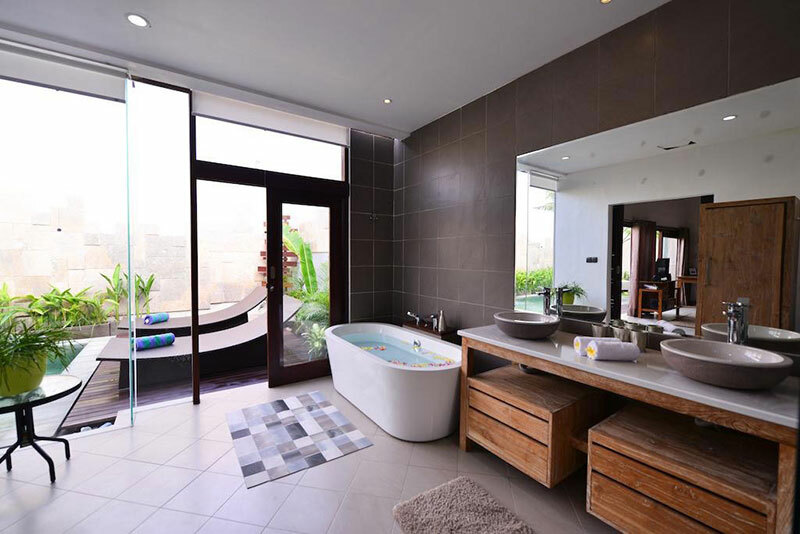 Isn’t it a lovely place to enjoy the soothing view while having a luxurious bubble bath? 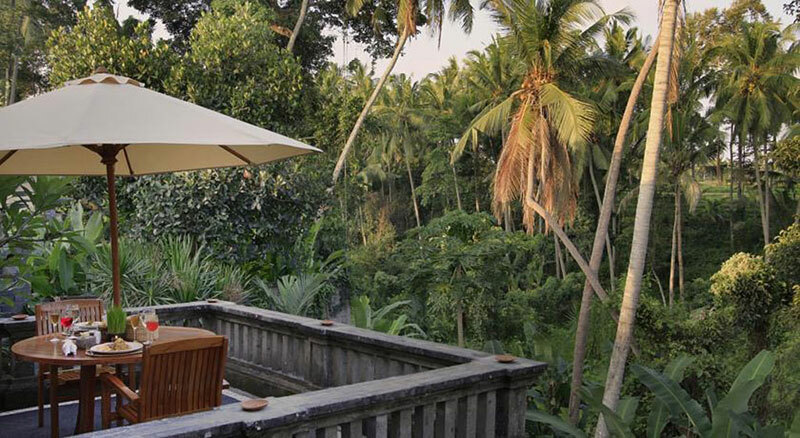 The spacious terrace overlooks the private swimming pool and the tropical valley beyond. And your poolside gazebo comes with a comfy daybed – the perfect spot for a quiet and intimate moment with your partner. 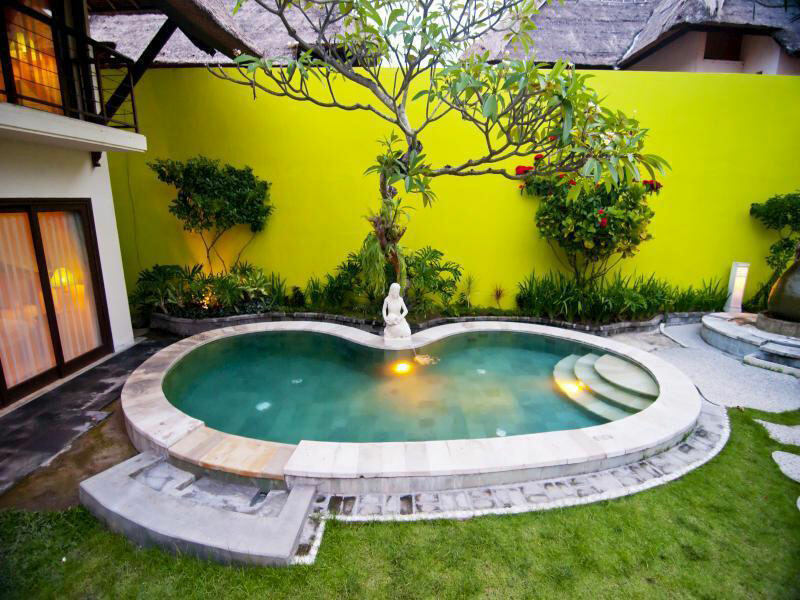 Have you always wanted to enjoy some intimate moments with your loved one in a pool in the comforts of your home? 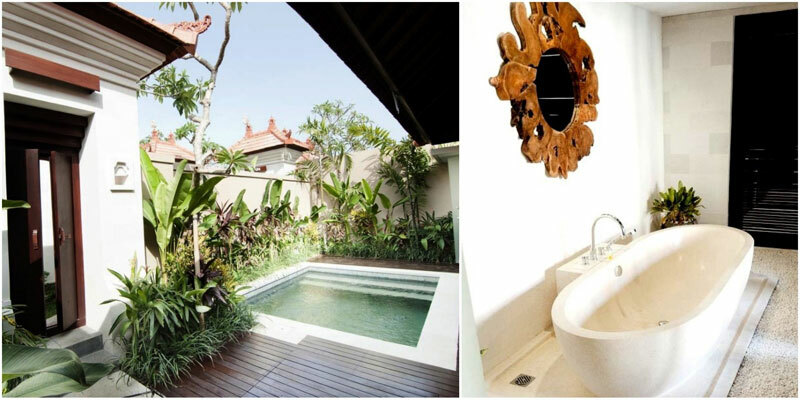 You can do so at Noah Villa and Chapel, where you get your own indoor plunge pool. 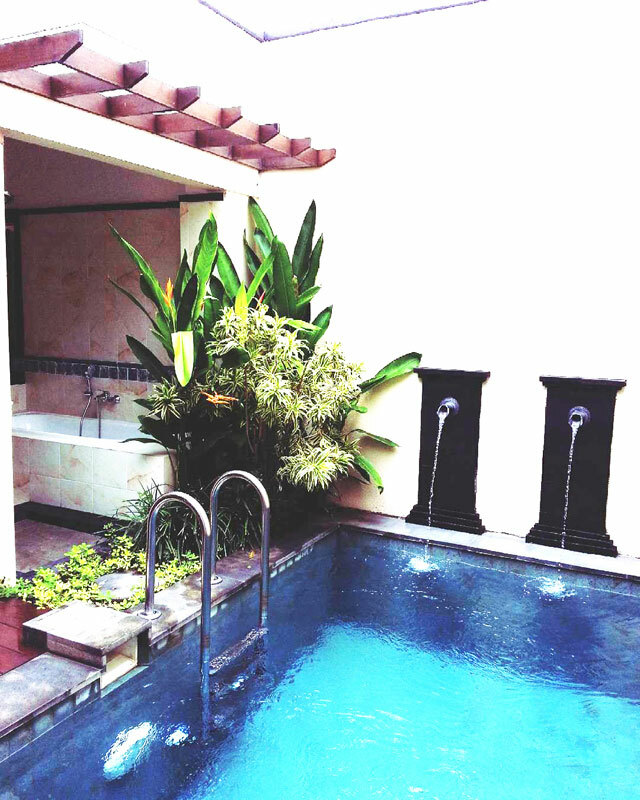 And if you want more space to swim, you can simply step out to the shared pool outside the villa. Situated in Uluwatu, some of the nearby attractions include the Garuda Wisnu Kencana Cultural Park, Consulate of Italy and Consulate of Denmark. 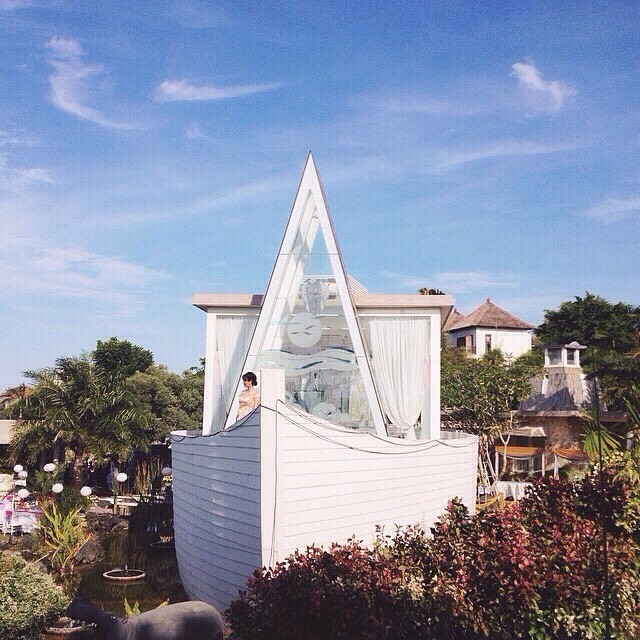 Noah Villa has its own chapel too – so if you’re thinking of having your wedding ceremony and honeymoon at the same place, you know where to go! 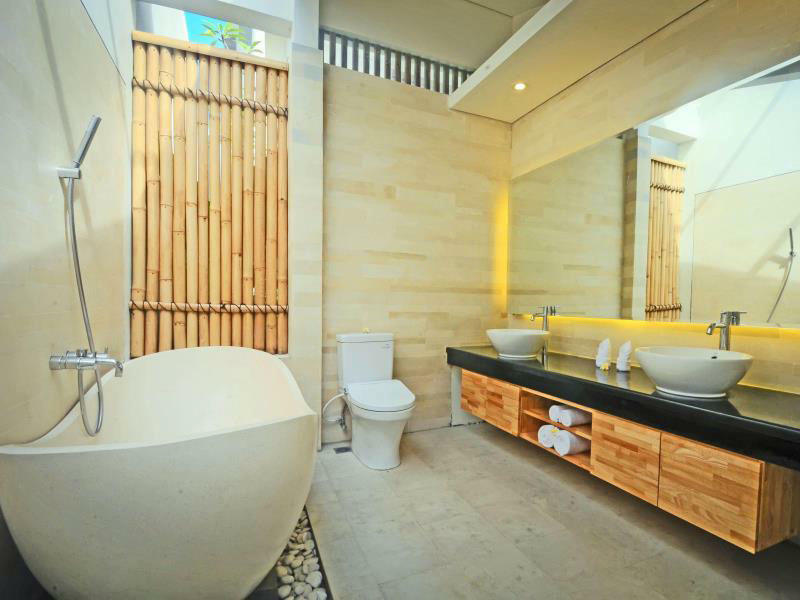 Imagine a traditional villa decorated with bamboo and wood, yet brightened up with a splash of colour. It immediately gives the originally stately home a dash of fun and almost screams whimsical. Have you ever seen anything like this before? Apart from the spacious bedroom and living room, this cheerful villa has its own terrace, steps away from a private pool nestled in a cosy garden. 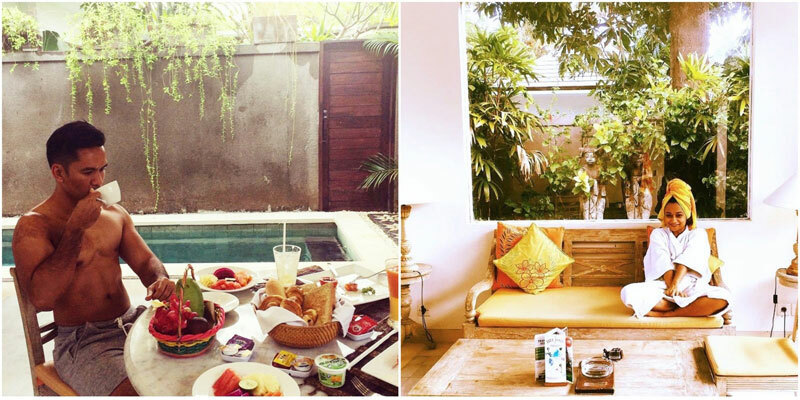 Now you can have breakfast amidst the lush greenery, before taking a relaxing morning dip! Fancy a night walk at the beach? 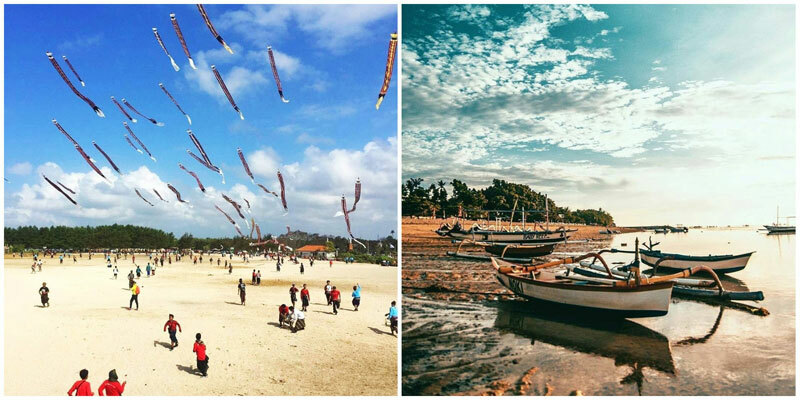 Dreamland Beach is just a five-minute drive away, while Pandawa, Padang Padang and Balangan Beaches are 15 minutes away by car. 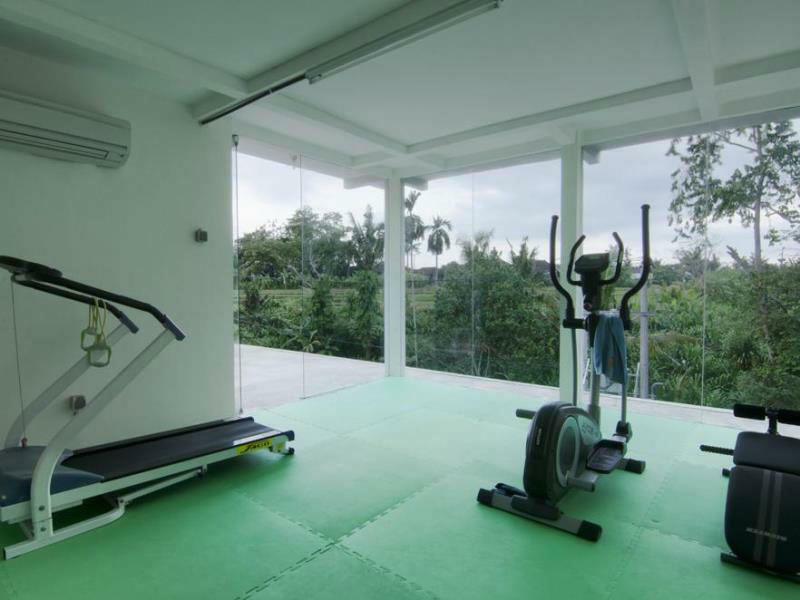 If you love golf, don’t miss dropping by the New Kuta golf course (which also offers yoga) just five minutes away. And of course, if you are bringing the little ones along, they will love the Green Waterpark and Nirmala Waterpark just five to 10 minutes away – these fun parks feature water slides, wavy pools and everything fancy that children go gaga over. 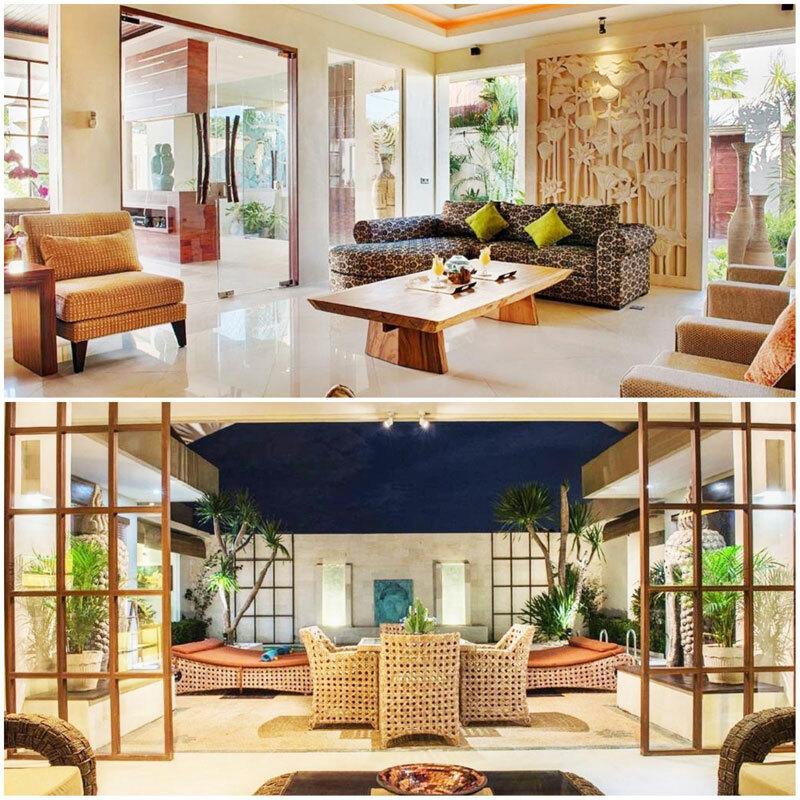 This spacious modern villa in Denpasar gives you all the modern comforts you can enjoy at home. Your outdoor private pool is just right outside from your bedroom – you don’t need a better reason for an early morning swim or a late night dip while stargazing! 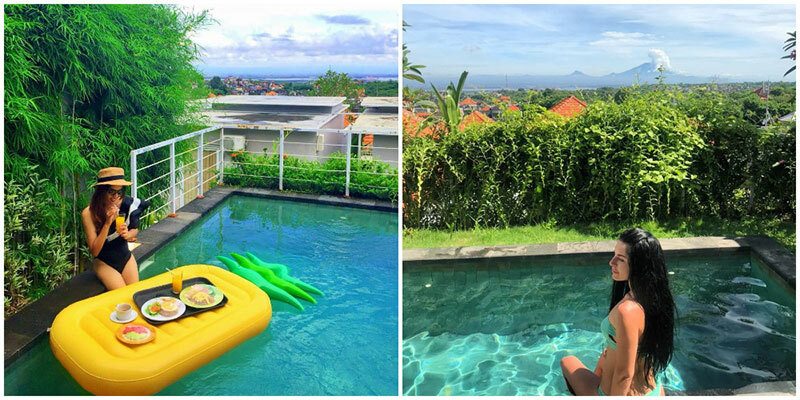 This gorgeous villa may slightly exceed the budget of $100 a night, but it’s too amazing to miss a mention, and it’s worth the little splurge. 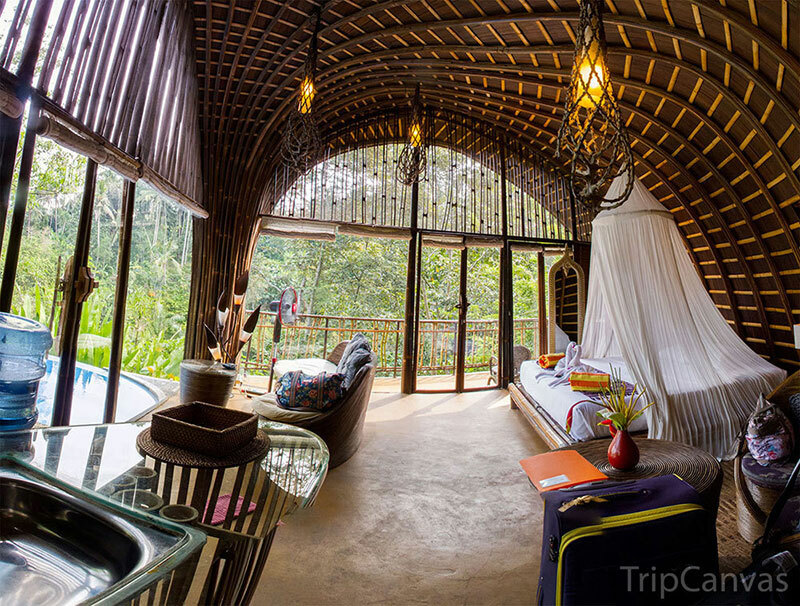 Here, what could be more romantic than being in bed together with your soulmate, watching fireflies casting their light over the beautiful jungle view? 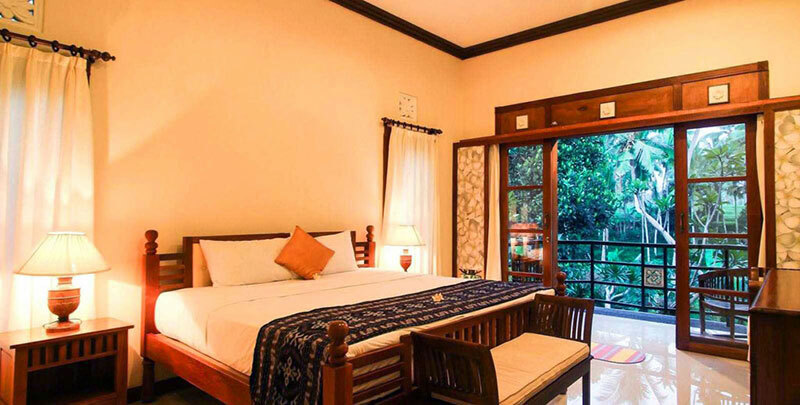 As a Shangri-la in the rainforest of Bali, Villa Pererepan (Villa Awang Awang) is set along the Petanu river valley, surrounded by gardens and jungle and offering amazing views, this villa is perfect for nature-loving couples. What’s more, it’s also an eco-friendly accommodation – almost all the furnishings and materials used in the décor are sustainable and of the highest quality. And did you know, the design of both the villa and the plunge pool is based on one of nature’s great mysteries – the golden ratio (otherwise also known as the golden section or the golden rectangle)? It encompasses the harmonic and symmetrical principles of nature itself. Nature expresses the golden ratio through a simple series of whole numbers which you may have heard of – the Fibonacci series. This one is for couples intent on escaping to their little private world. 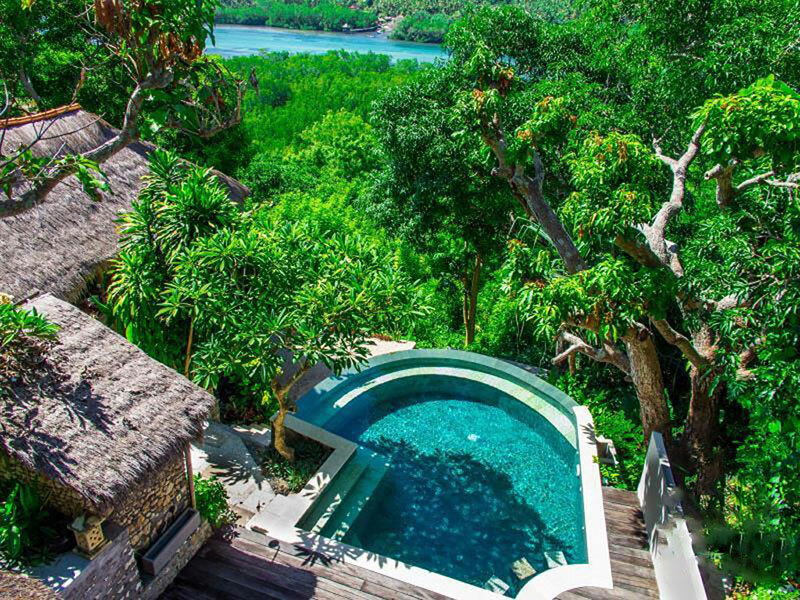 Looking over the ever-changing channel that sweeps between Bali’s exotic islands – Nusa Lembongan and Nusa Ceningan, Twin Island Villas offers a unique setting that will awe any couple. Even your dining table is perfectly set to enjoy the view. This charming hiding place has direct access to the white sandy beach, and it’s so quiet you’d feel as though you’re strolling on your own private island. 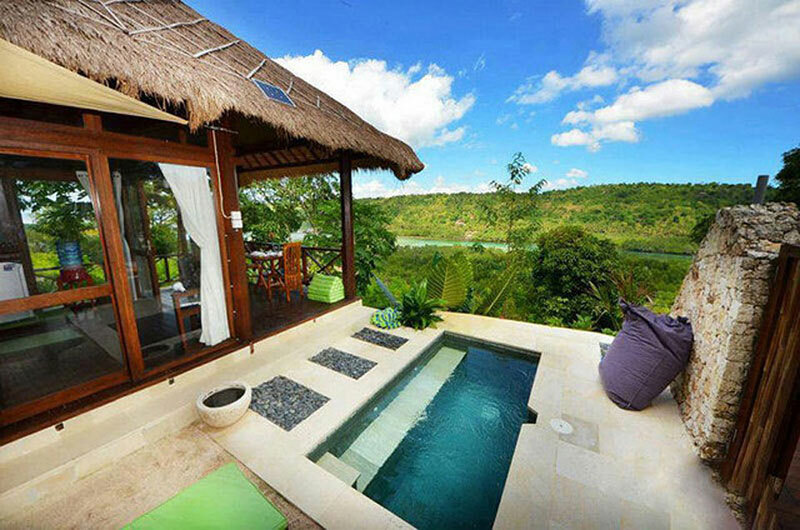 The private plunge pool may not big enough for you to swim in, but who wants to work out on a honeymoon anyway? It’s small and intimate – the best corner to chill with your soulmate. At Athena Garden Villa & Spa, Balinese-inspired thatched roofs and traditional design come together to create the perfect tropical getaway for you. The green plants in the garden add on to the calm beauty of the villa. There’s even a private gazebo next to the swimming pool, perfect for planning that romantic candlelight dinner! 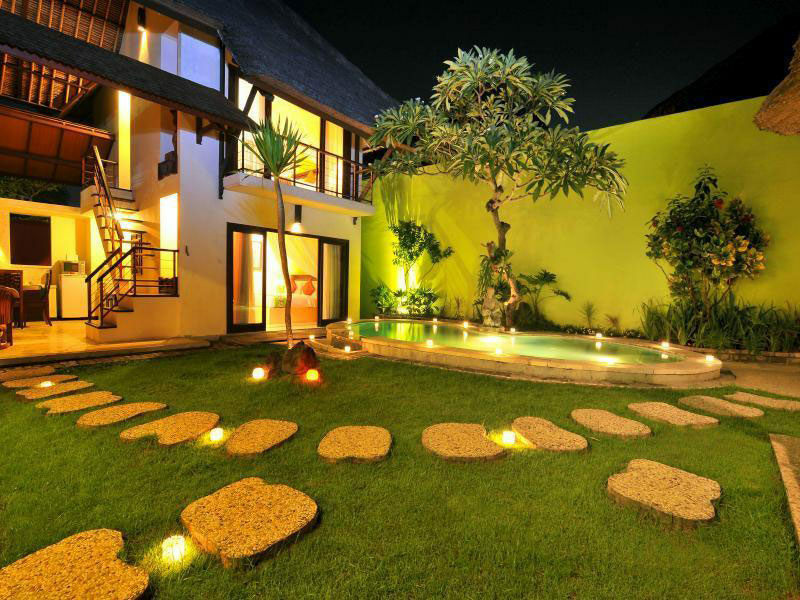 Just lay out a few candles in the grass and watch the villa light up with an ethereal glow that just screams romance. And if you are a lover of art, the Museum Trick Art 3D is also located just a stone’s throw away – as if this place wasn’t already perfect. 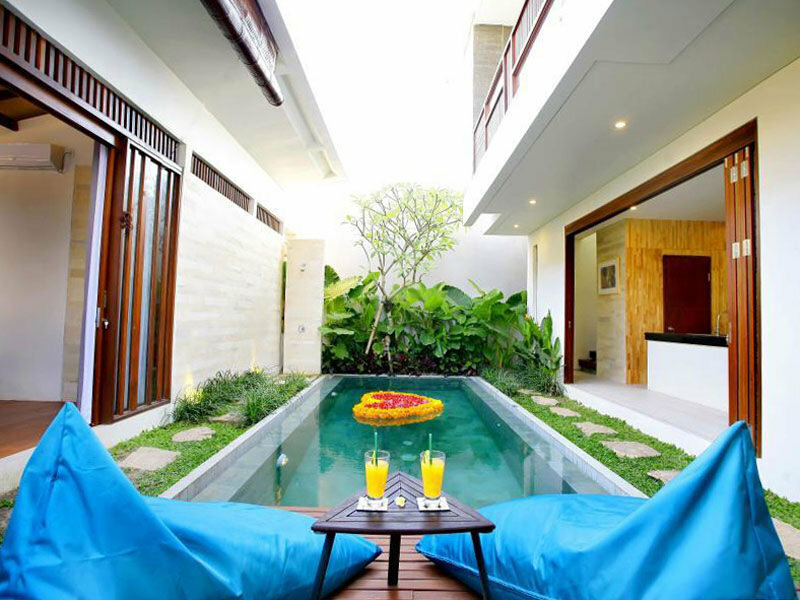 Do you know of more awesome private pool villas in Bali? Comment below to let us know!